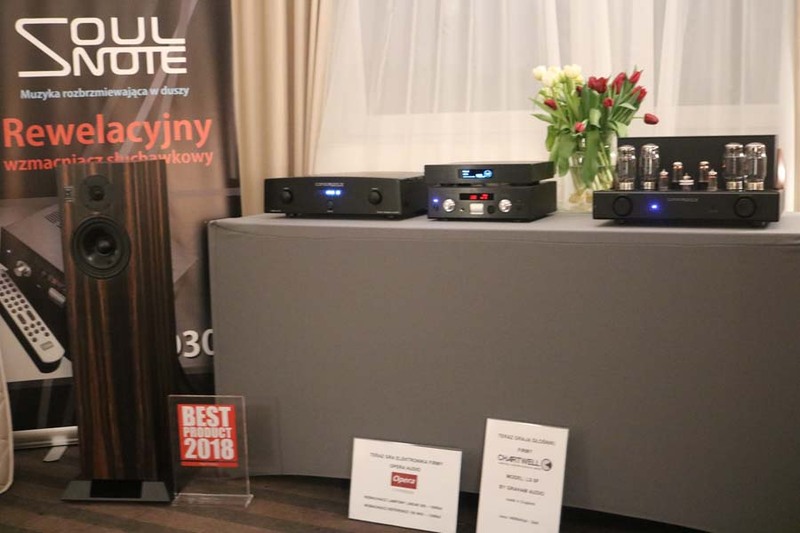 Part two of Hifi Pig’s coverage of what is fast becoming our favourite Hifi show in Europe – Audio Video Show Warsaw 2018. 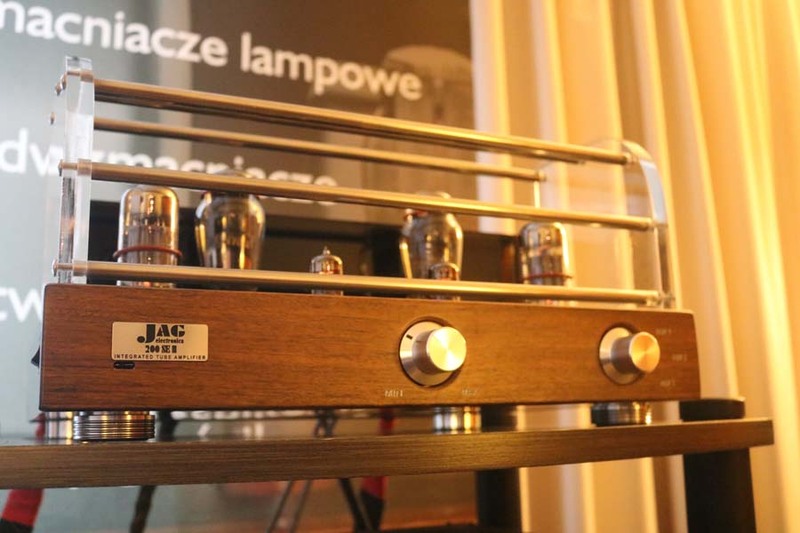 Jag Electronics are a Polish based company that you may well not have heard of, but they should certainly be on your radar judging by the sound they produced at this year’s Audio Video Show Warsaw. 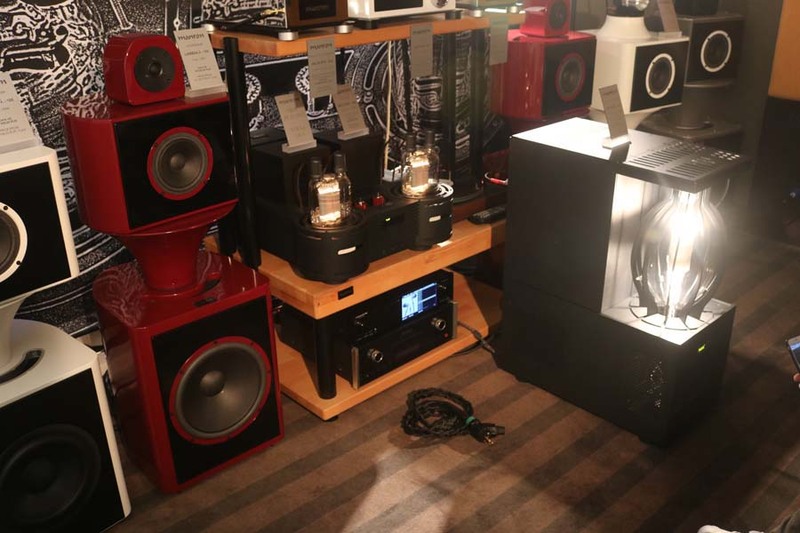 They produce a handful of amps (their 200 SE II is pictured on top of the rack), some speakers and a range of cables and what they call a Bluetooth Analogue System DAC. 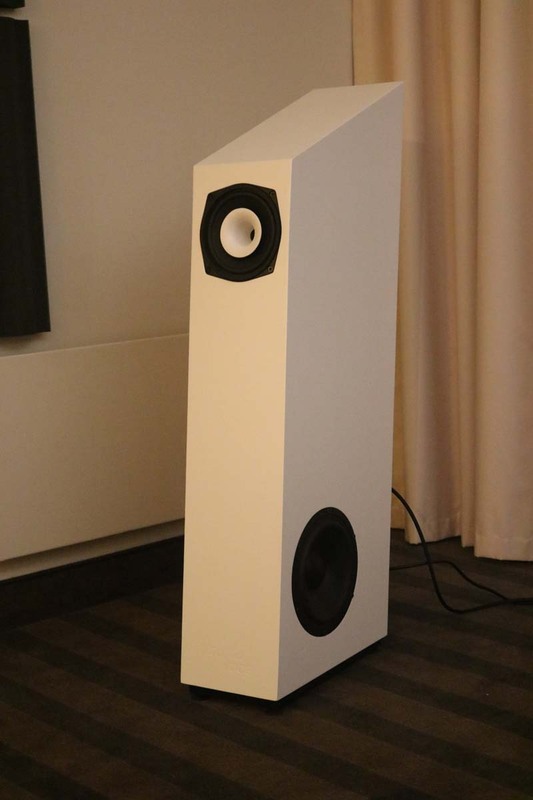 The speakers are very good and look like they follow the advised construction for Audio Nirvana loudspeakers. 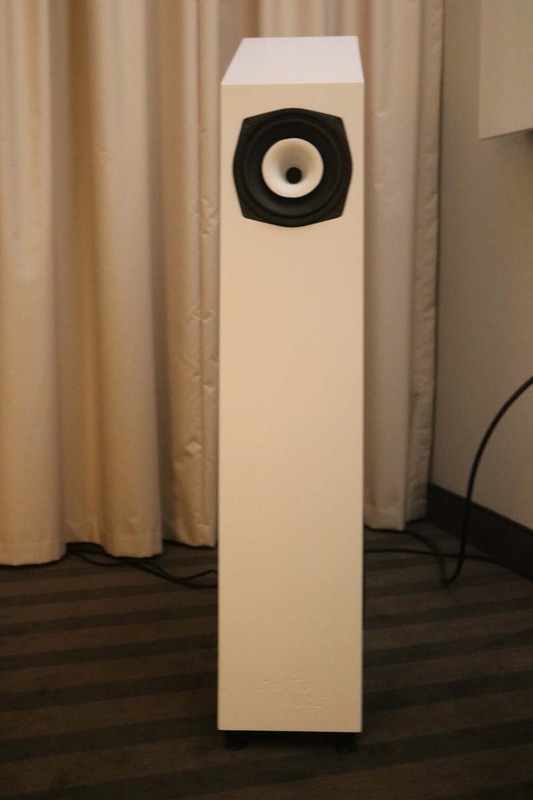 If you have ever looked at making your own wide-band speakers then I’m sure the American brand Audio Nirvana will have appeared on your radar – they are very good. 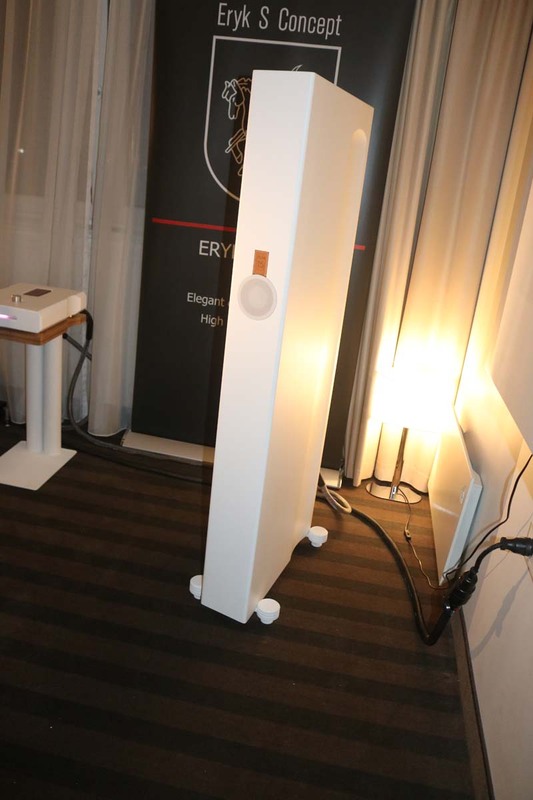 This was a very deep sounding room with the speakers having a claimed response down to 31Hz. I loved that the guys in the room were playing proper music (ACDC if i remember correctly) and in all honesty I found this room hard to fault and so one of the best rooms of the show for me. 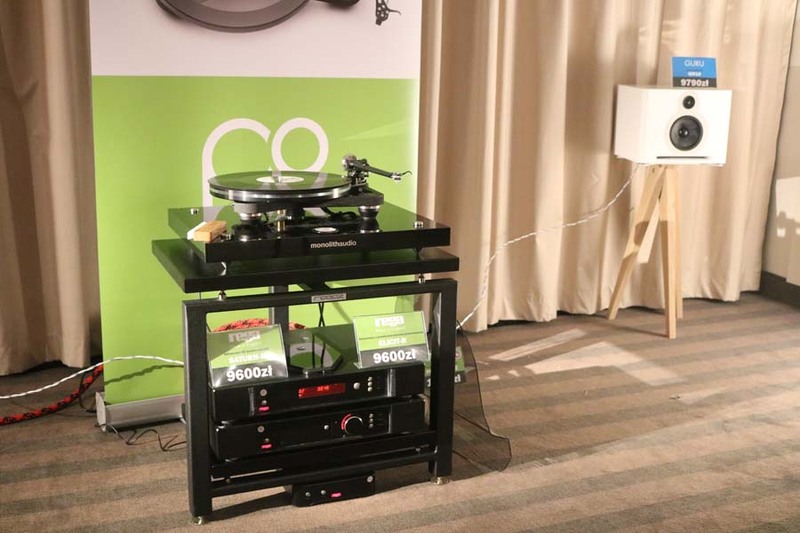 This is the Tentogra turntable which we first encountered at last years Audio Video Show Warsaw – and we were suitably impressed by it then. It’s unusual in its format looking to be the size of a 70s music centre, but it is impeccably finished. 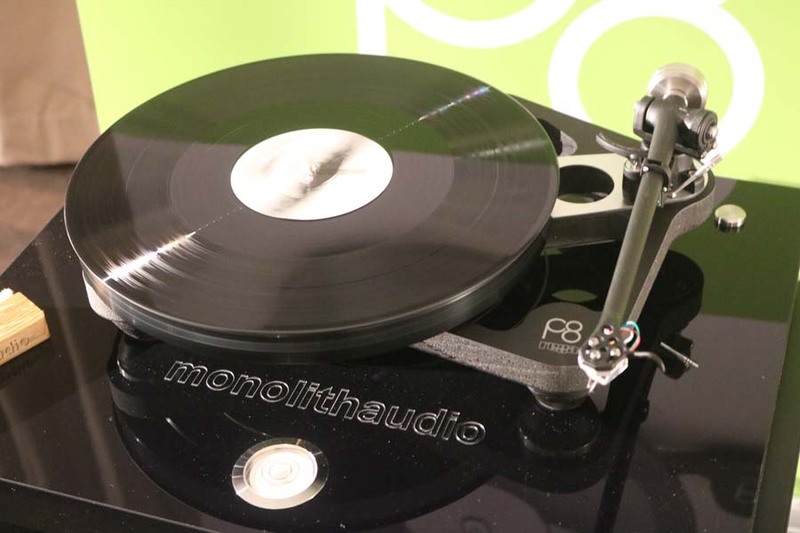 The turntable uses a battery power supply so it is isolated from the mains and is said to be more precise than a mains supply – i can certainly see the advantages. 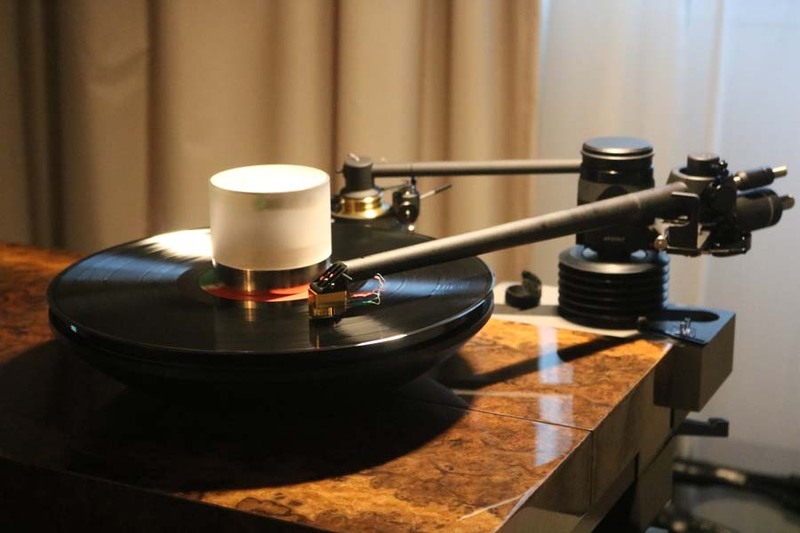 As well as 33 and 45 the Tentogra turntable also sports a 78 speed function and a second arm specifically for shellac records. The battery allows for 30 hours of playback and charging takes around 8 hours. 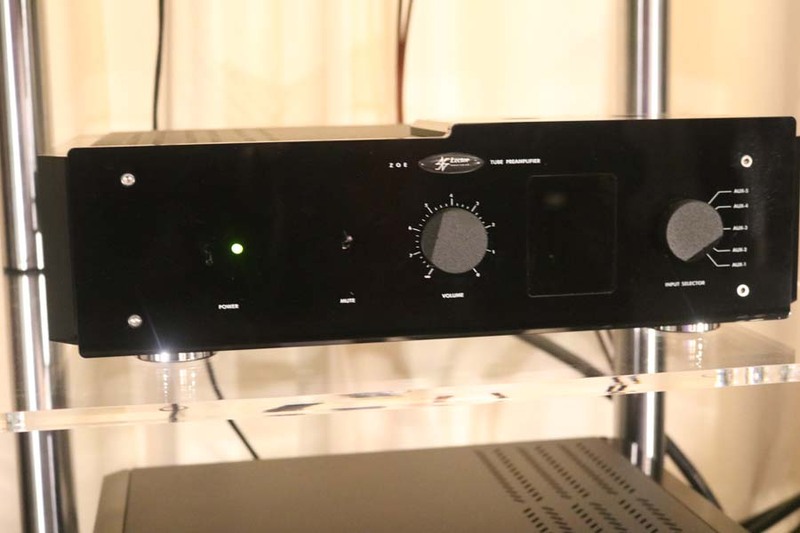 Tentogra were using a EAR 912 phono preamplifier, Sky Audio OTL amps which we featured in the first part of our coverage here and a pair of Cabasse speakers. The sound, they were banging out Led Zeppelin was BIG, dynamic and forward, but also very detailed. I liked this room a lot. 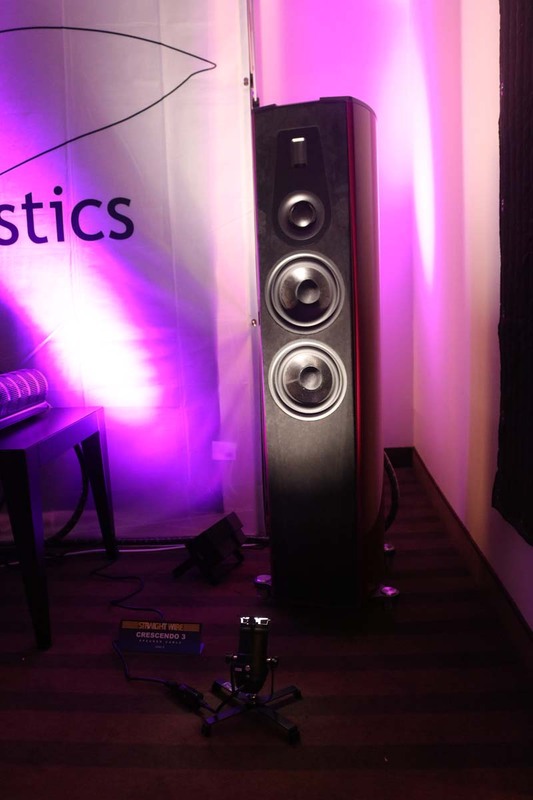 Materics speakers were making their debut at Audio Video Show Warsaw and very interesting they were too. They are made of a material called Azanite which is used not only for the cabinet but also for elements inside the speakers. When playing the speakers when touched have absolutely no vibration in the cab, even when driven pretty hard. 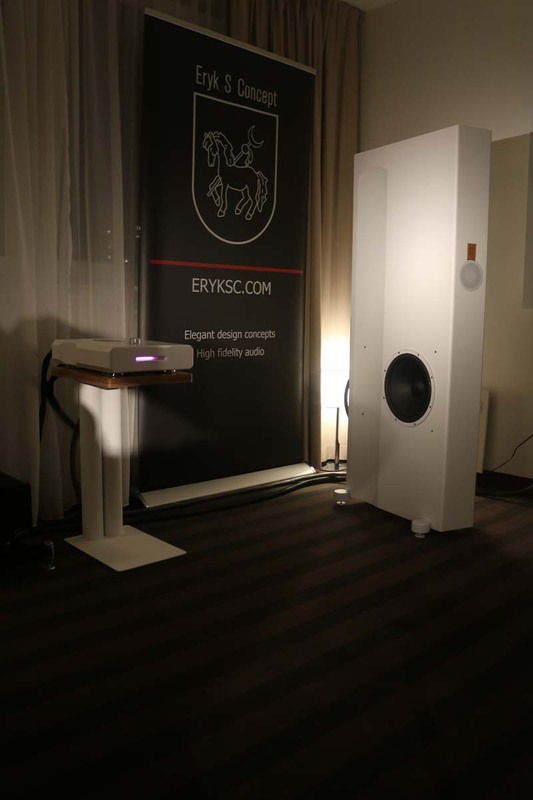 The speakers cost 5000€ at the show but will retail for 7 500€ thereafter. 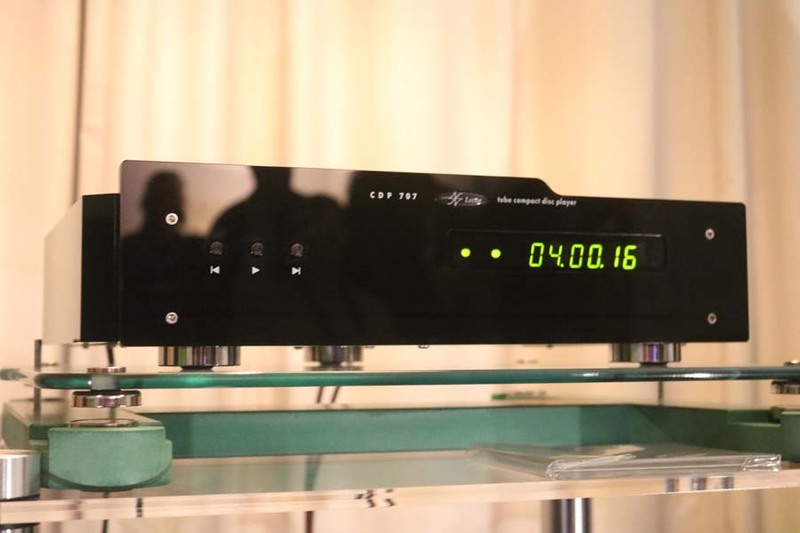 There was also a new Class A amp from the company being used. Sound was relaxed and warm with nice imaging. 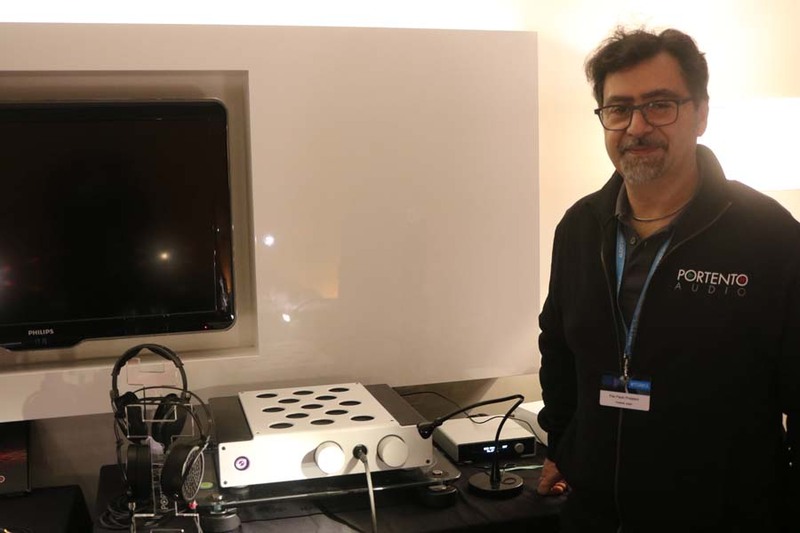 Sadly when we asked for a picture of Marco Tagliaverga, the MD of the company, we needed the lights turning on which caused all the electrics in the room to blow meaning we only have the one photograph. Apologies to all that we didn’t manage to make it back to the room later in the day. 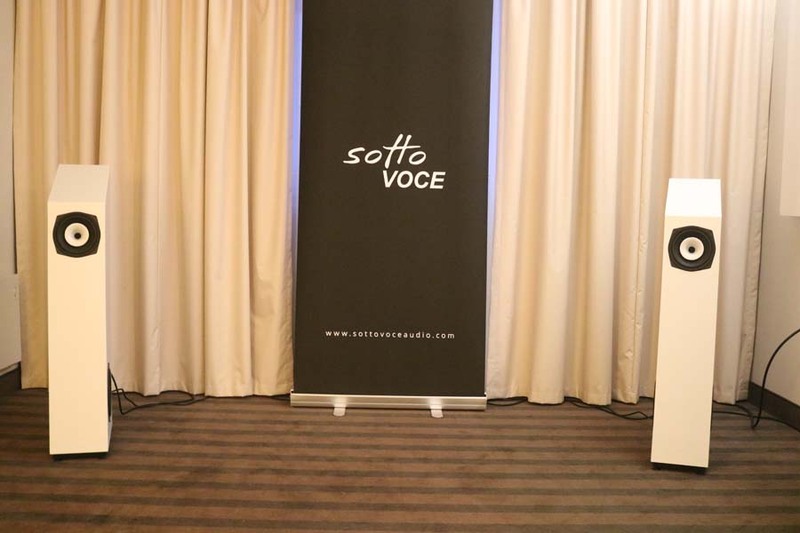 Spanish high-end loudspeaker manufacturer, Sottovoce Audio has announced the Stereo 3, a high end, active, floorstanding loudspeaker. 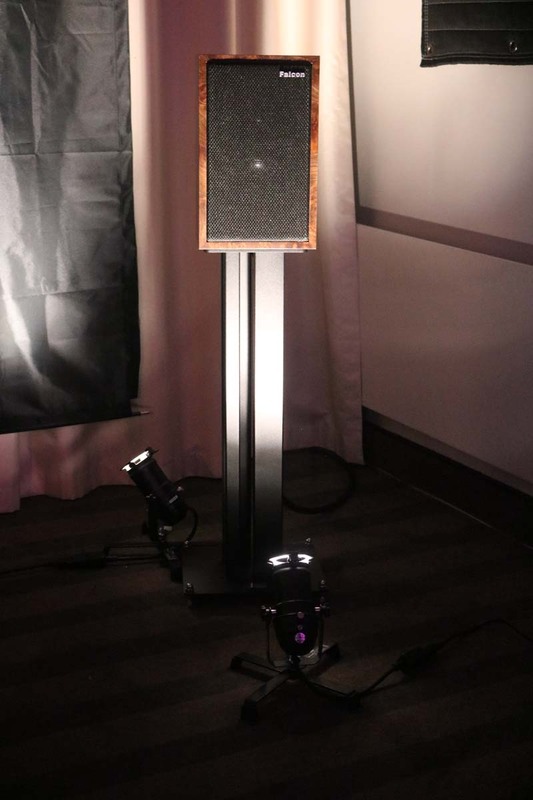 This 3-way active loudspeaker is designed around a coaxial mid/high range, front radiating, 165 mm neodymium transducer. 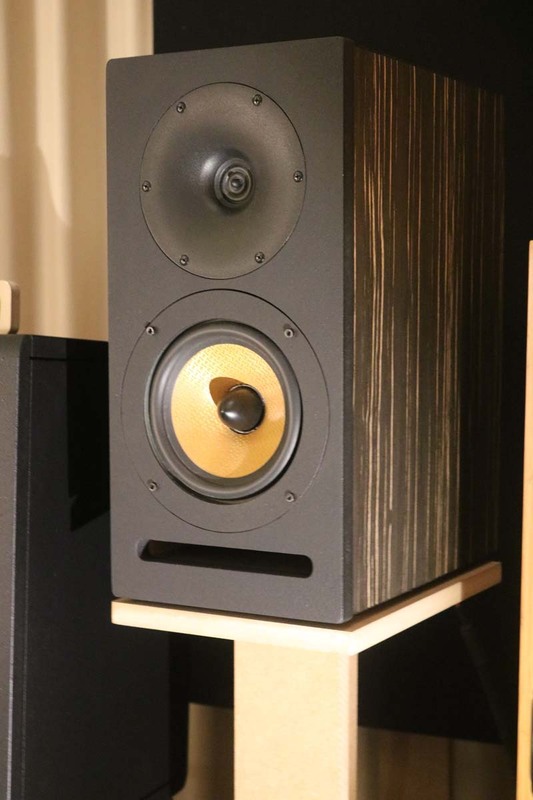 Two side firing, 200 mm, long stroke bass drivers are mounted in a back-to-back configuration to cancel out cabinet vibrations at high sound pressure levels. 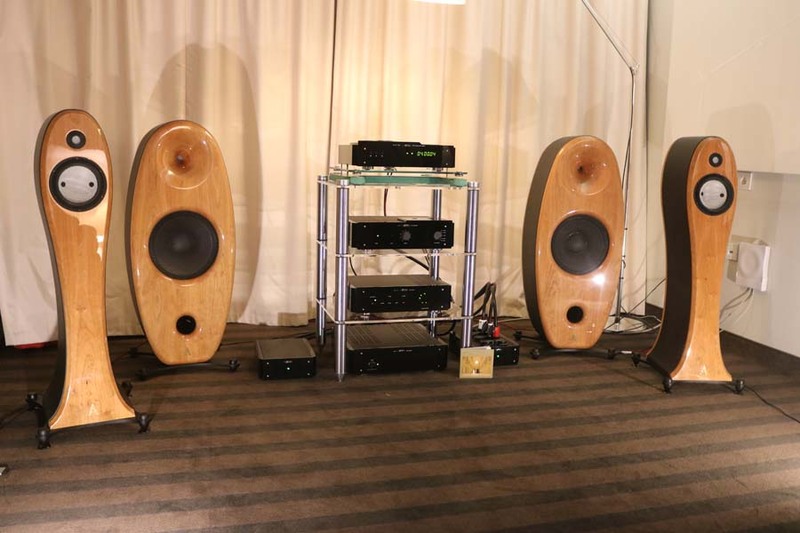 The bass drivers are set close to the floor, in a sealed chamber. 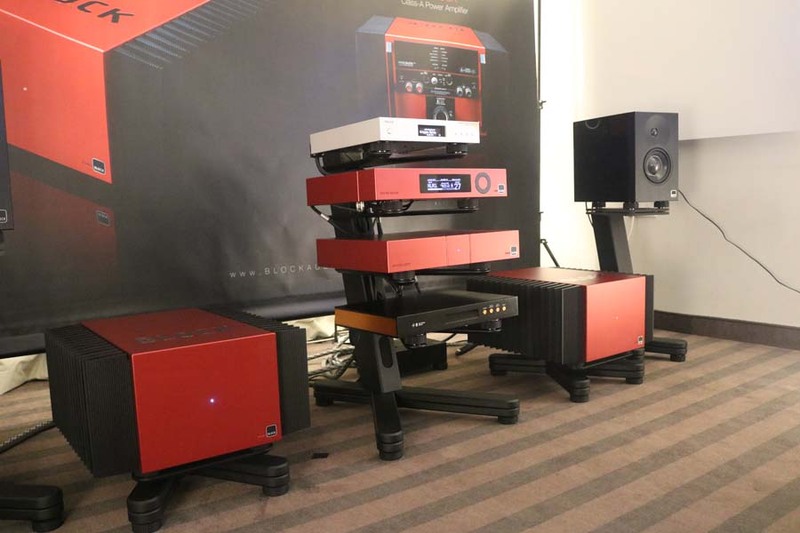 Stereo 3 is an active loudspeaker with an internal total power amplification of 400 W. The built in, class D, amplifiers keep energy consumption very low (17 W/hour, idle and below 85 dBSPL/1m). With a moderate size (just 195 mm width), the Stereo 3 has no need for external power amplifiers. 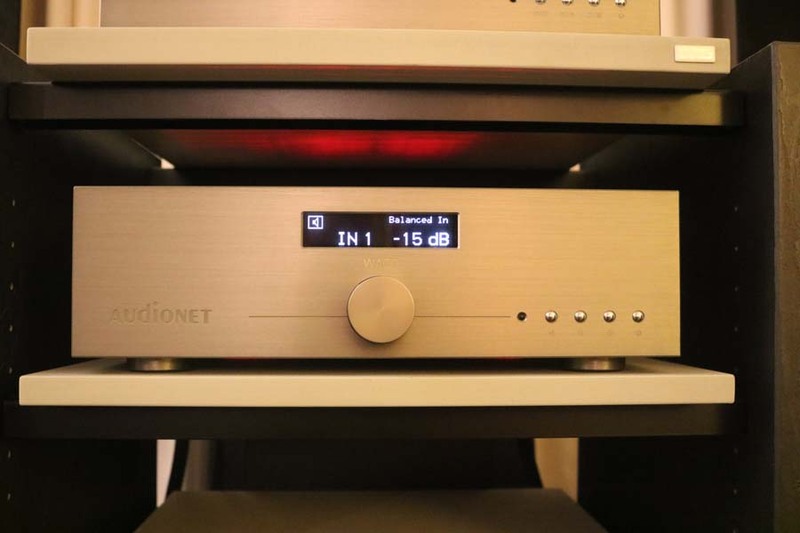 A balanced audio input connector (analogue or digital) allows for a direct interconnection with streamers, digital-to-analogue convertors or preamps, reducing system components to a minimum. 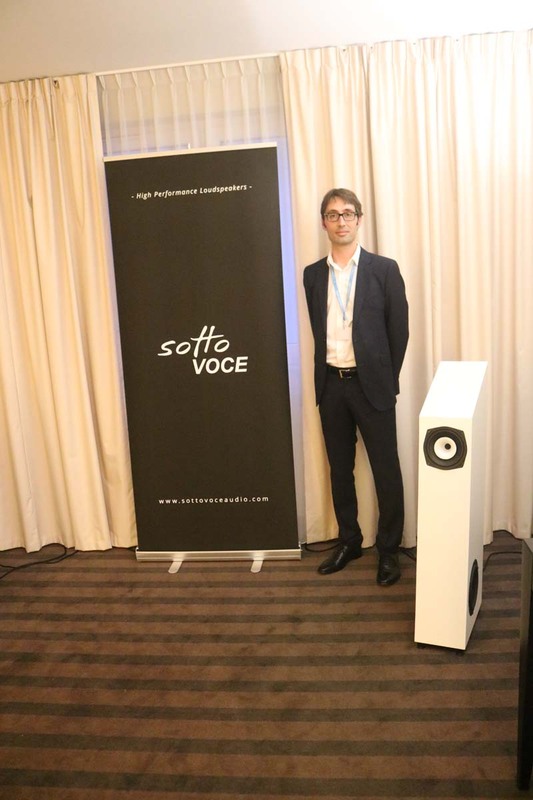 Stereo 3 active loudspeakers are designed and manufactured by Sottovoce Audio in Valencia, Spain. Besides standard finishings, custom colours or finishes are also available upon request. 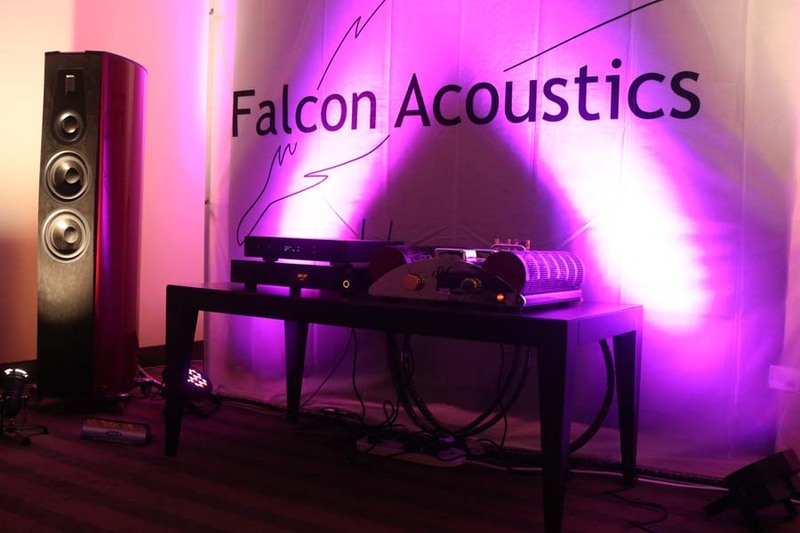 Each loudspeaker is delivered inside a custom aluminium heavy duty flight case for secure transportation. They are priced depending on the finish and the country of distribution, but for a guide, in Madrid you are looking at a price at just under 7,800€, plus vat. Played us Daft Punks’ Giorgio, a tune we play a LOT, and here we had fantastic imaging with tight and communicative bass registers. Dynamics were very good and in the intro to the tune Moroder’s voice was natural sounding. This was a really good listening experience with me getting the hairs on my arms standing up to attention. To my mind this is a very good loudspeaker for the asking price, especially given that it is active so there is no need to buy amps. Another star of the show for me. 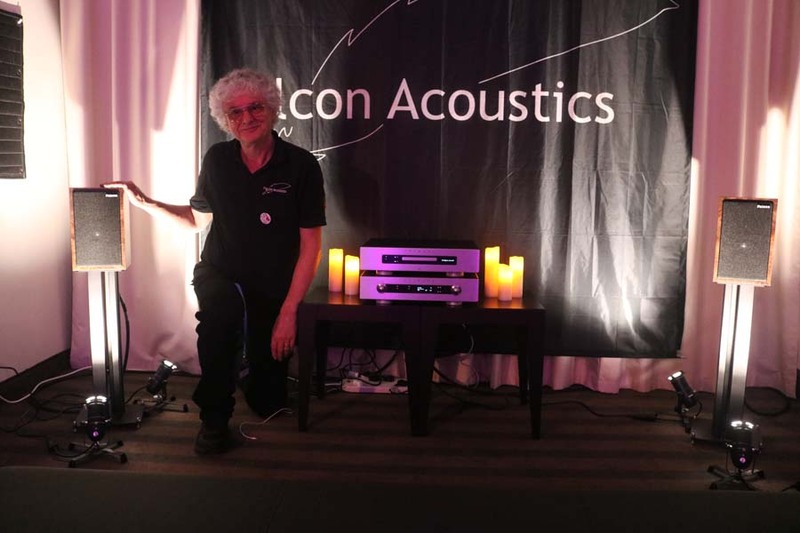 Lector are an Italian brand that make a fairly wide range of products that include CD players and transports (at the show they were using Digidrive TL – a toploading transport that has XLR AES-3/spdif by RCA and spdif by BNC outputs) preamps, power amps, integrated amps and DACs. 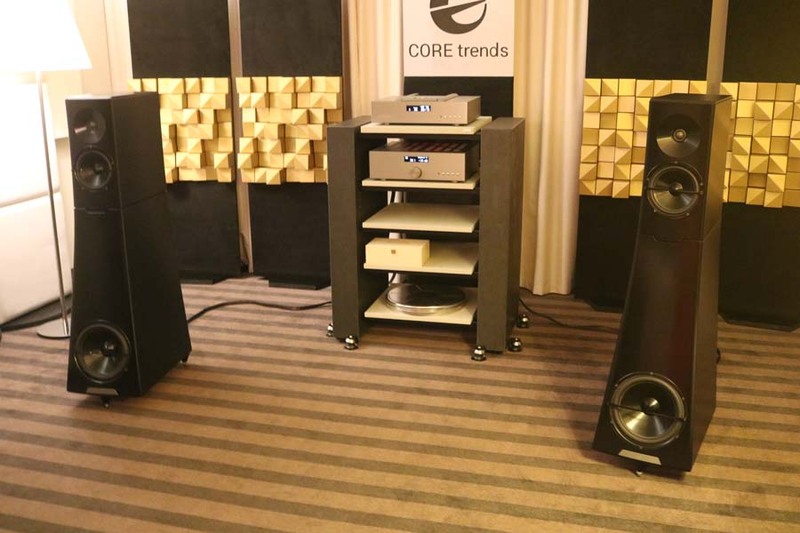 Aida Acoustics make the speakers in the room with the two models shown being the Thasis and Galatea models, with the latter having Accuton drivers. Sound was spacious and detailed. 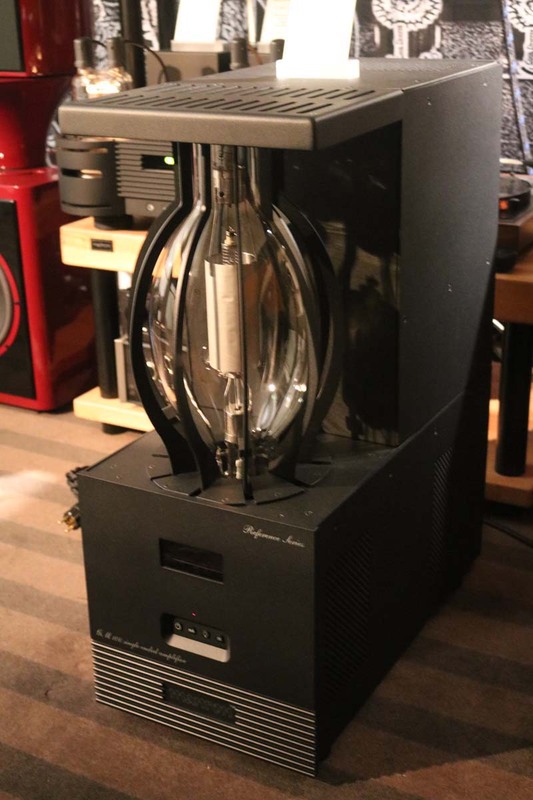 First of all we had a demonstration of the Graphene coned GC6500 Reference loudspeaker being driven by an EAR Yoshino V12 amplifier. 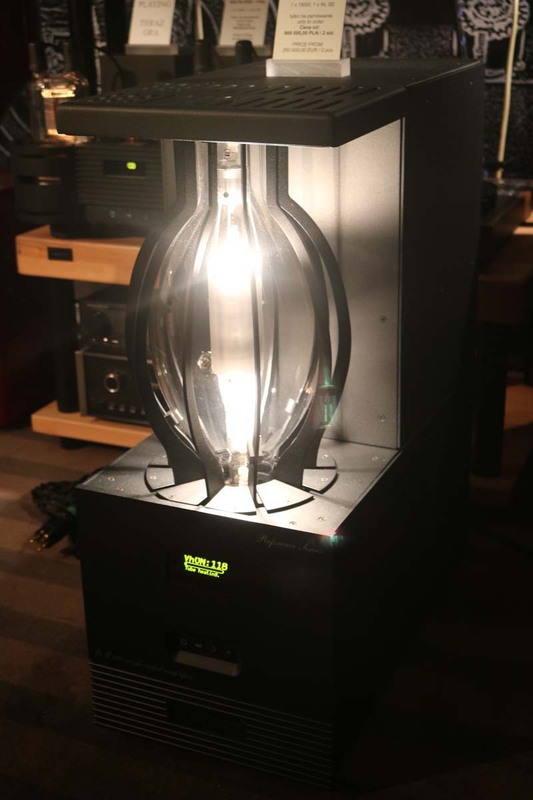 The sound was very good indeed but Jerry wanted us to hear their Classic 15 ohm LS3/5a – fully licensed by the BBC, and hand-assembled by Falcon in Oxford England. 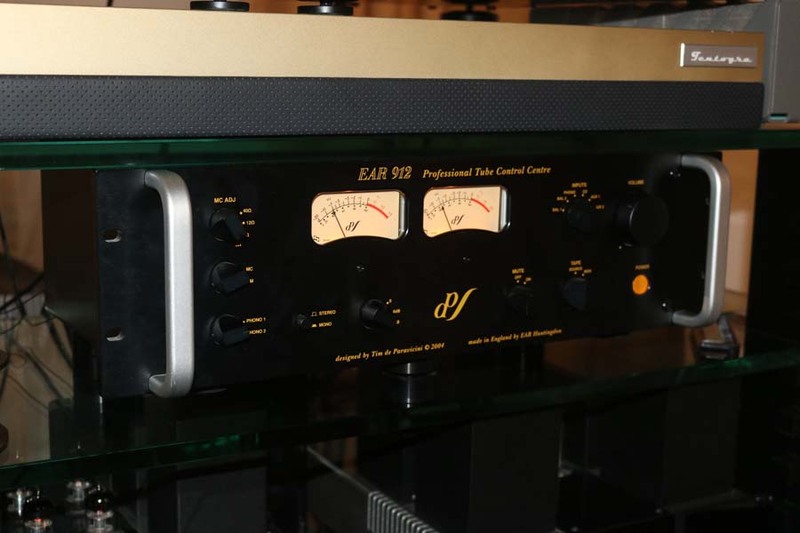 It is the only LS3/5a in production that faithfully replicates the original BBC design published in October 1976 says Jerry. 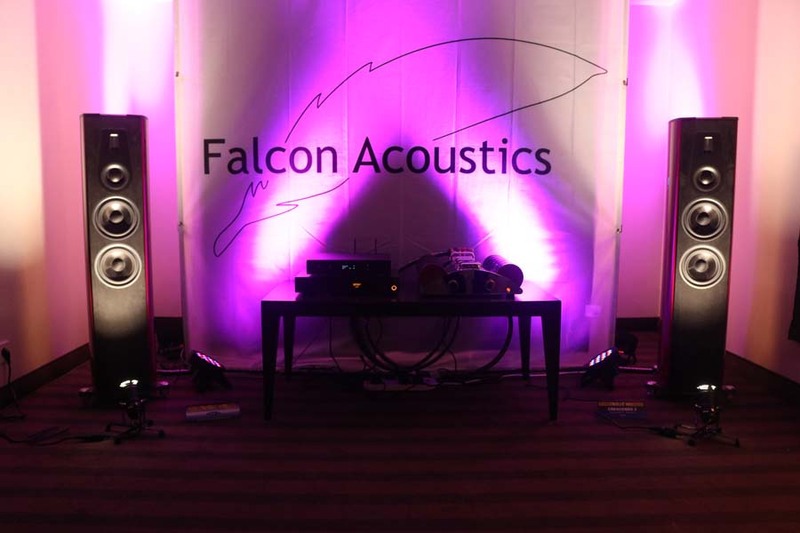 The drive units are the renowned Falcon B110, and the Falcon T27 tweeter, both designed by Malcolm Jones, the original designer of the KEF B110 and KEF T27 that were specified in the original 15 ohm LS3/5a version designed by the BBC and are made in the UK to be identical to the original BBC models. The matched 15 ohm BBC Specification FL6/23 filter networks are made exclusively by Falcon in the original transformer-style to BBC specification and contain inductors specially made in Britain for Falcon to the original specification. Now these were a class act using Primare electronics with pin-point imaging and a smooth unforced character that really drew me into the recording. 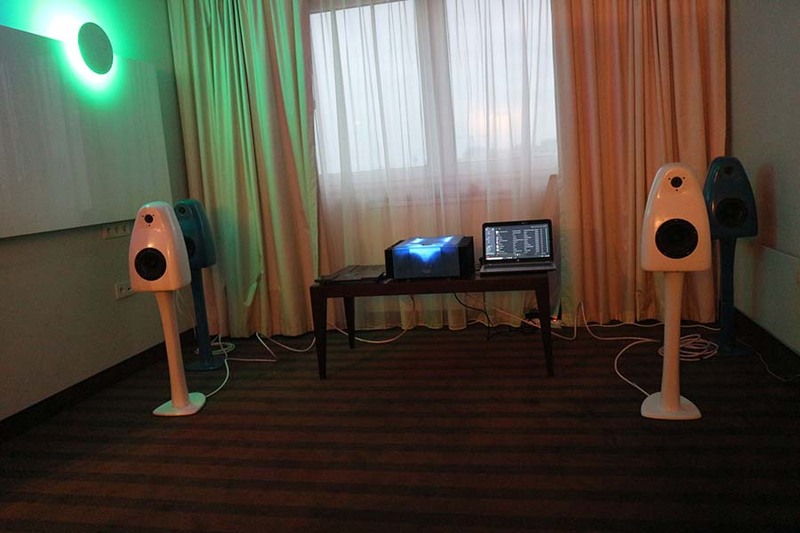 Of course bass isn’t going to be spectacular with these speakers, but on the tunes we listened to I just didn’t care. Another one of the stars of the show for me and clearly for the Polish visitor and his partner who walked in the room whilst we were in there – he listened for a few seconds and immediately asked “Do you have a Polish seller”. We knew this chap was looking to buy a new pair of speakers on the day as we’d seen and heard him in other rooms and it looks like he’s found his new speakers. 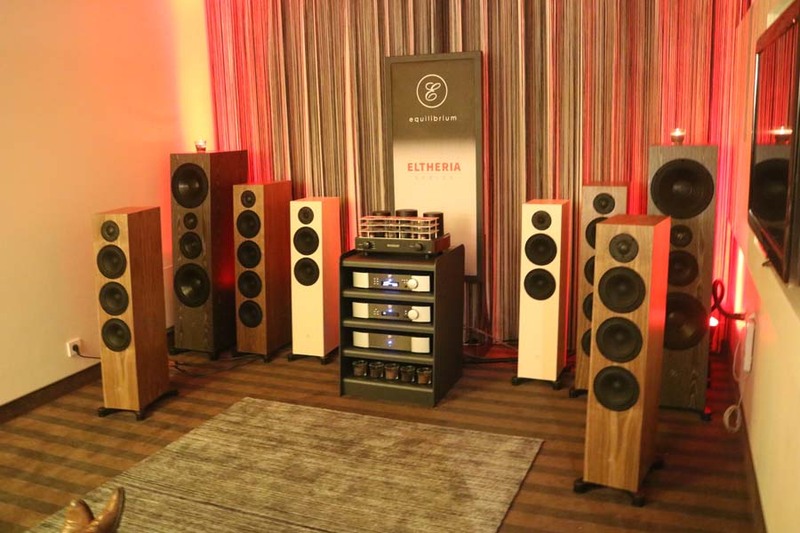 Speakers in this room were from the Eltheria range by Equilibrium being driven my Moon electronics. 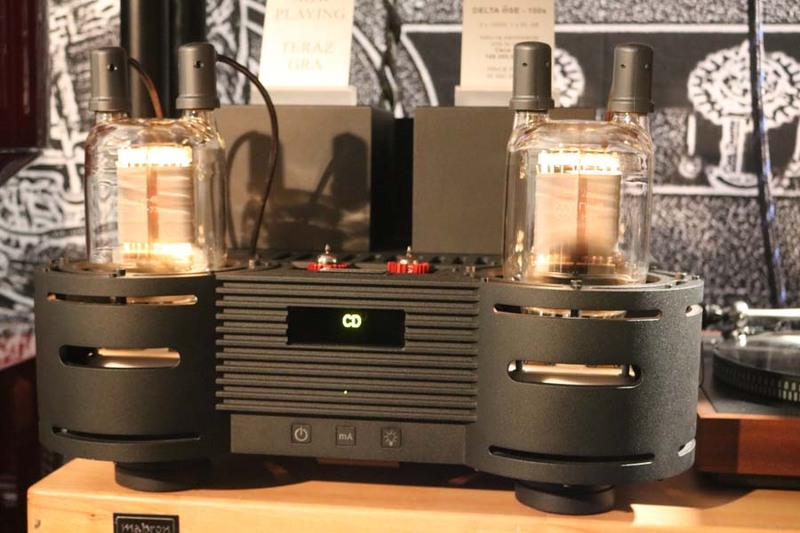 The amp atop the rack is from Mastersound but we didn’t get to hear this. This was a very busy room and had a smooth and refined sound which kept people in the room and listening. 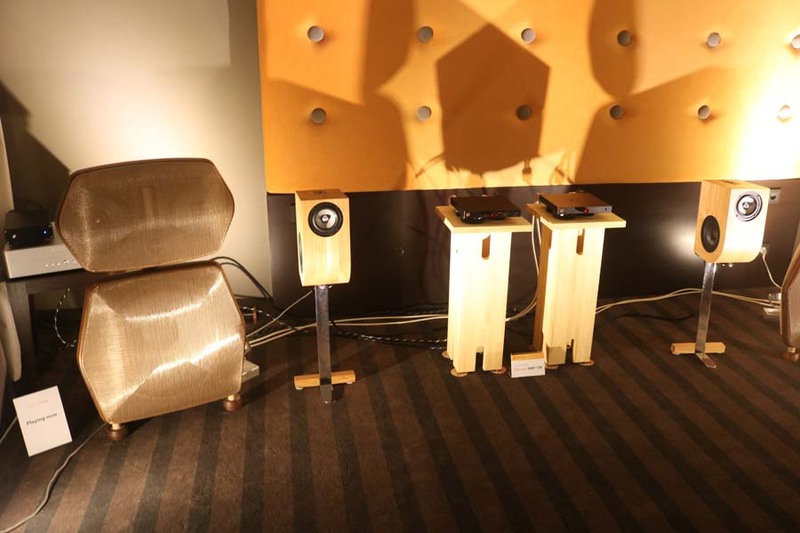 Audionet electronics playing into YG Acoustics Hailey loudspeakers. 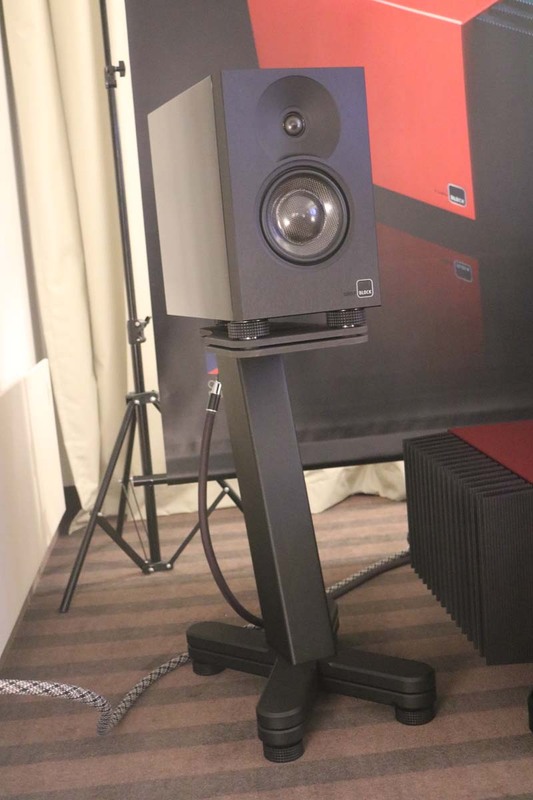 The speakers are interesting in that they are milled from a solid billet of Aluminium with a claimed response down to 20Hz. You’ll notice if you look carefully that the rack is supported on Townshend Audio Seismic Isolation Support Corners. 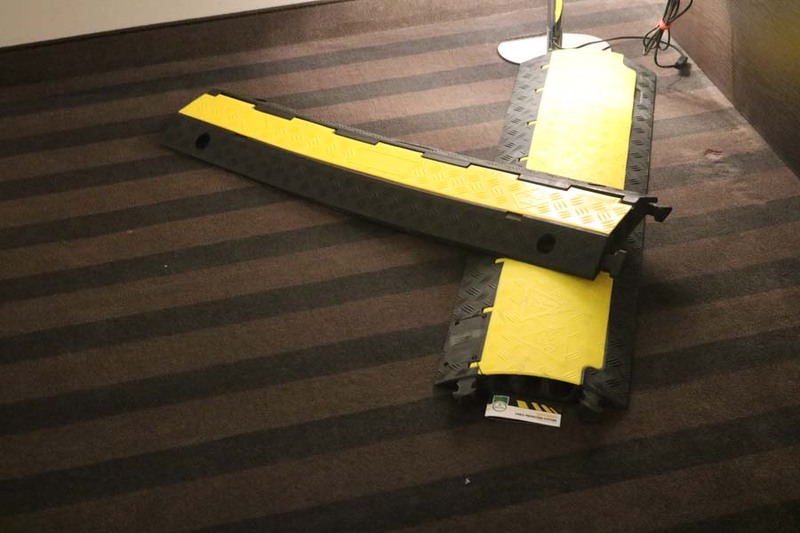 Max Townshend does a great demonstration to show the efficacy of these platforms using a seismograph – it’s impressive and they really do work well. Whilst in the room there was an unknown blues track with guitar and piano really coming to the fore in a natural and convincing way and with great dynamics, detail in the top-end and lovely tight bass. I liked this room but definitely in the high-end category with regards price-point. 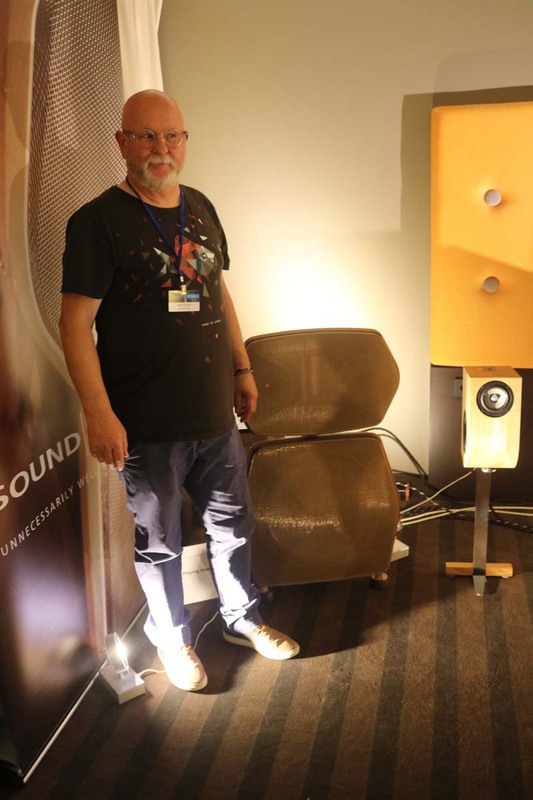 Martin Gately from SoundKaos is based in Switzerland and here is stood next to the larger SoundKaos LIBéRATION loudspeakers that use an open baffle design along with ribbon tweeters in a package costing just over £17,000. 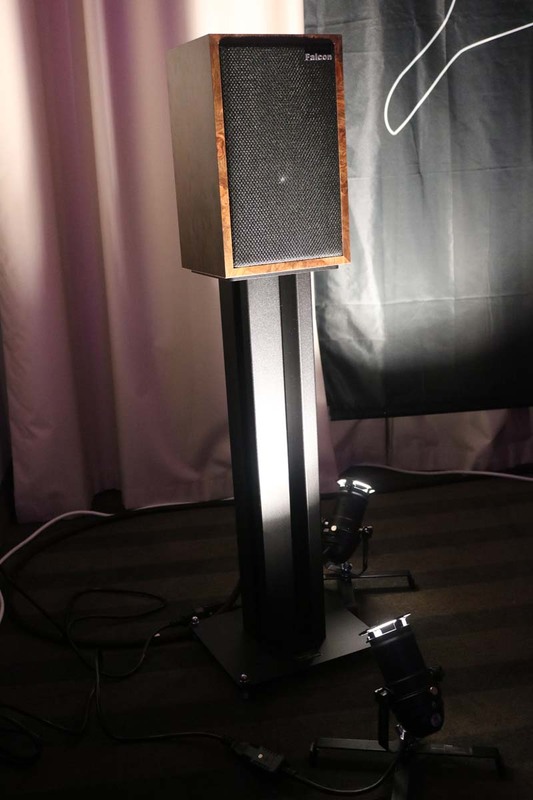 When Hifi Pig reviewed these speakers we said that “The LIBéRATION is a breath of fresh air in the loudspeaker marketplace and a product that should be taken very seriously if you are in the process of buying a high-end monitor, providing a very open and large sound-space, but with great detail as to placement of instruments, largely from that Raal ribbon. 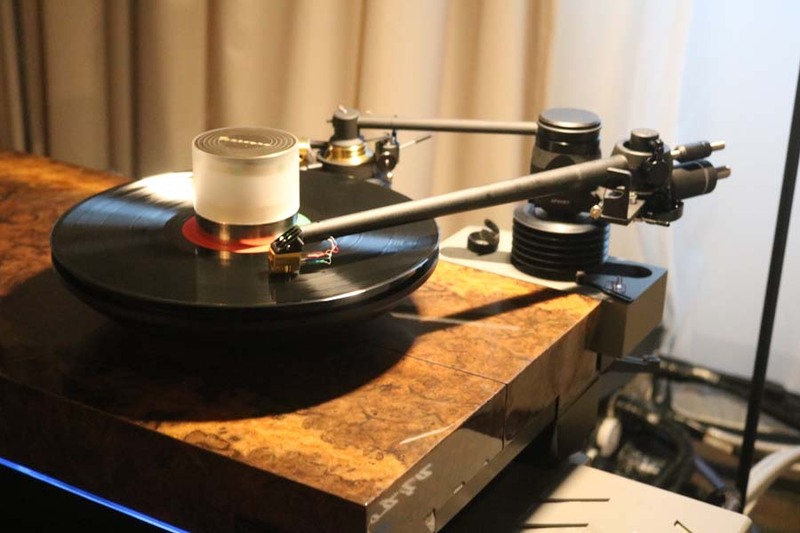 It does work best on classical music, but once I had positioned it correctly and fed it with well-engineered rock and blues, this little robot was very well mannered and I really was sorry to see it go home to its maker.” You can read the full review here. 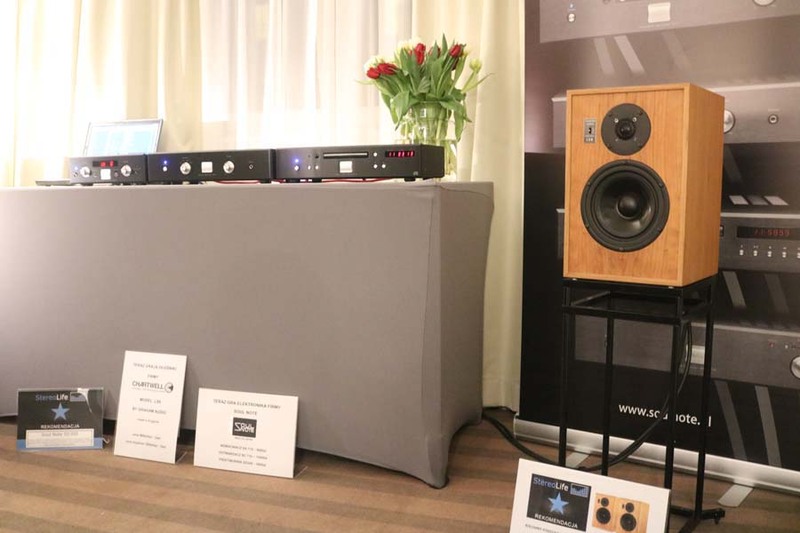 On the day the LIBéRATION speakers sounded REALLY natural being driven by the little 25W Amp13 from Bakoon that runs in Class AB but it was the smaller of the two speakers that really grabbed my attention. 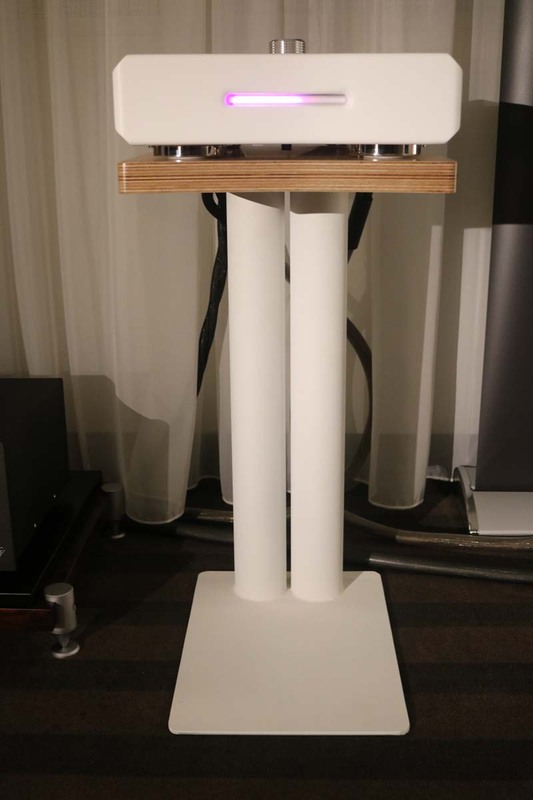 It’s called the Vox 3, is a three way design with the RAAL ribbon tweeter being mounted on top of the cabinet. 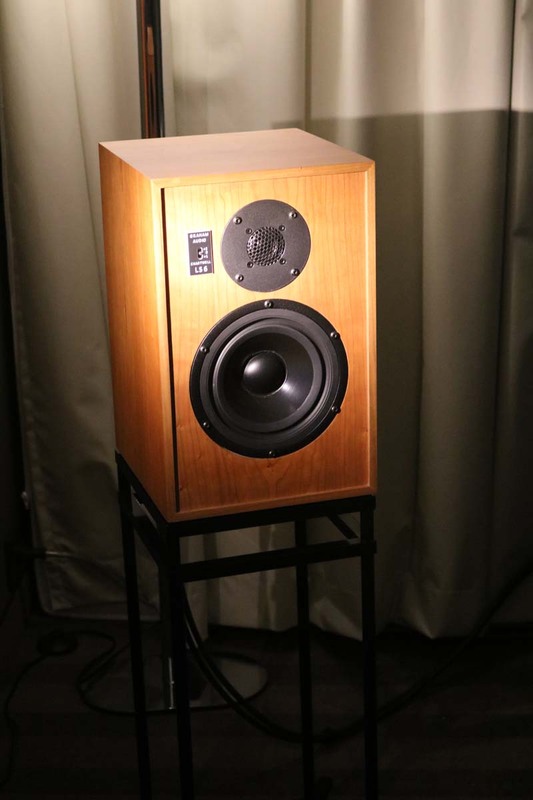 Each cabinet has 2x 13cm force cancelling custom GALM Audio drivers set in a ported enclosure made of solid wood. 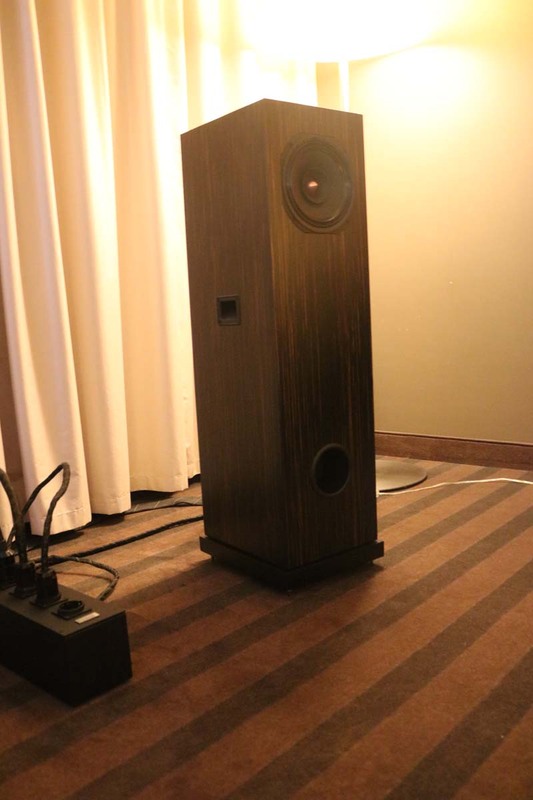 Again to me the sound was open and natural with a really good bass, though Martin reckoned the bass was a bit boomy in this room…whatever, I really enjoyed them and I look forward to having them reviewed for Hifi Pig in the near future. So, we make our way down to the next floor of the Sobieski and head for the far end of the corridor, we have a method as I mentioned, but you know something is afoot when you are dragged into a room by your other half – an act that totally had our regimental methodology thrown to pot. Bu then this upset in the force was certainly worth it…read on. 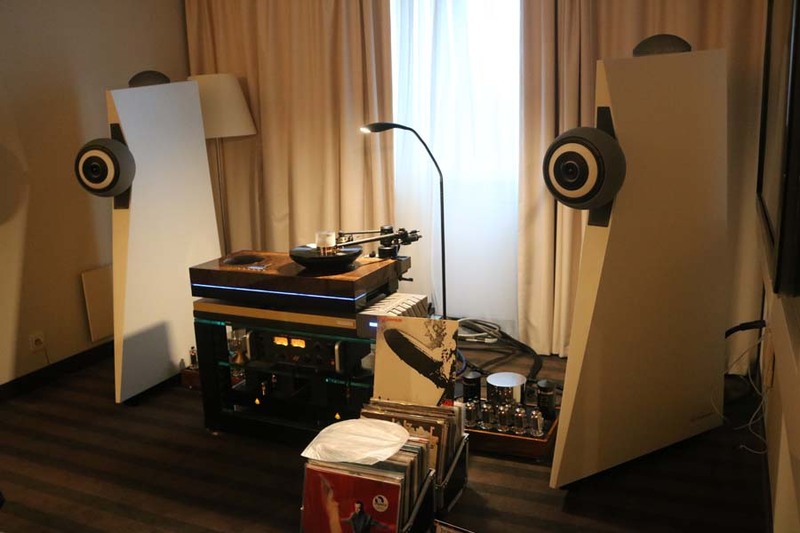 So there we are listening to The Streets (if you don’t know them look them up and check their first two albums) at a Hifi show – well whodathunk it? 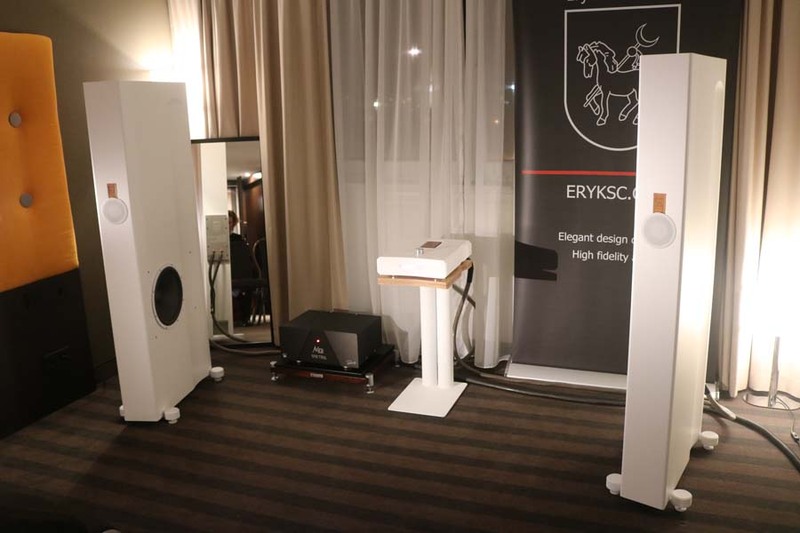 The Eryk S Concept Speakers are called Wind and the amp/player is called Fire with the package being Fire and Wind…obviously! 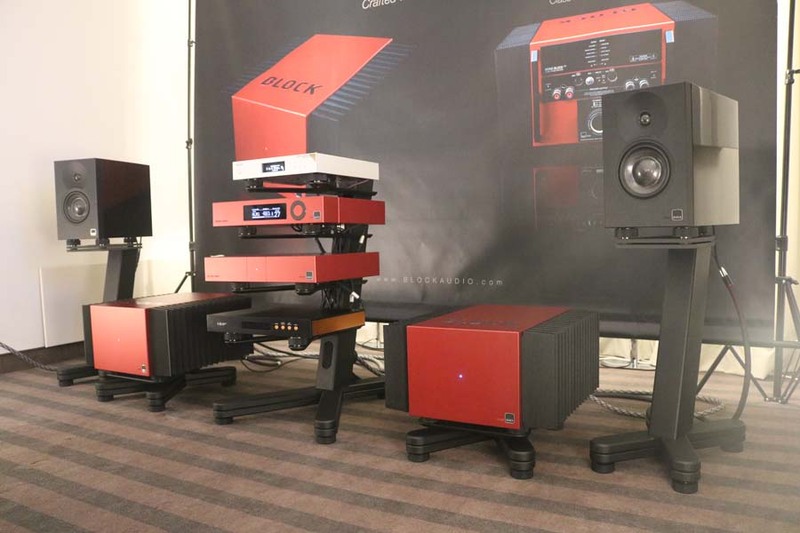 As a full system it’s hard to knock the aesthetics on show here and the amp has onboard Wi-Fi, Blutooth, a phonostage plus the usual suspects of inputs. Fire outputs 200W per channel. 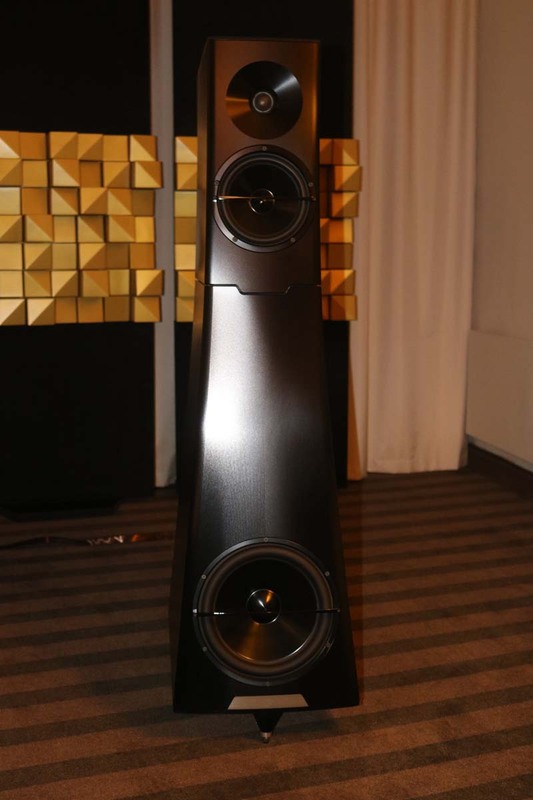 The speakers weigh a hernia inducing 200Kg each but still manage to look elegant and poised. 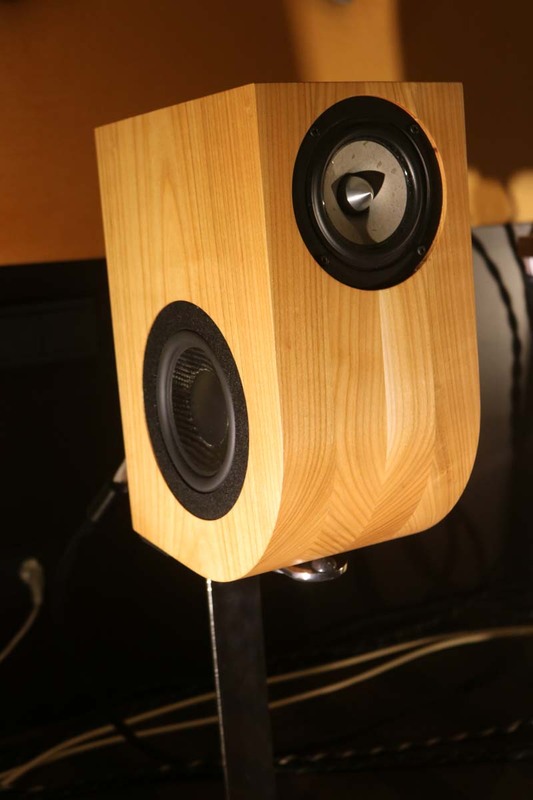 They are a two way design sporting a 30cm cellulose woofer that uses an Alnico magnet and is situated in the side of the cabinet. The 13cm wideband driver is obviously front firing and is made of Japanese cellulose. Eryk Smolski was keen to get feedback for what is clearly a “lifestyle” ststement product and I was more than happy to give it having heard this system. What you have is what I would consider to be my kind of sound which is big, with plenty of bass and superb imaging. 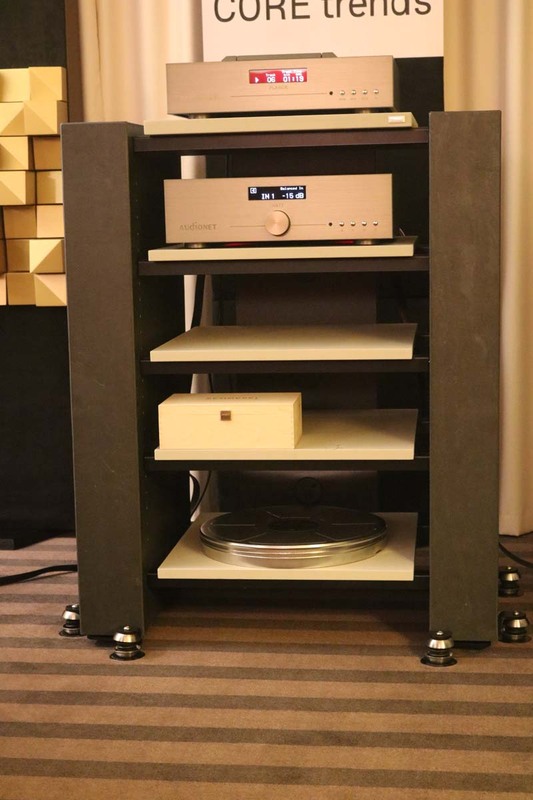 Not only did this 19 000€ system sound great, it also looked great too. 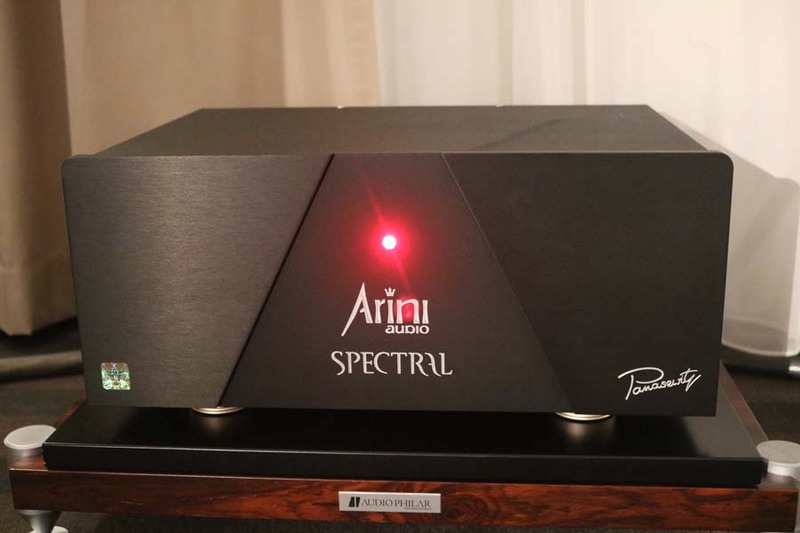 Power conditioner and all cables in the system were by Arini. Hats off to this room for playing what many consider not to be show-suitable music as after The Streets we were treated to Poor Leno by Royksopp. Brilliant room and another reason you should book for next year. 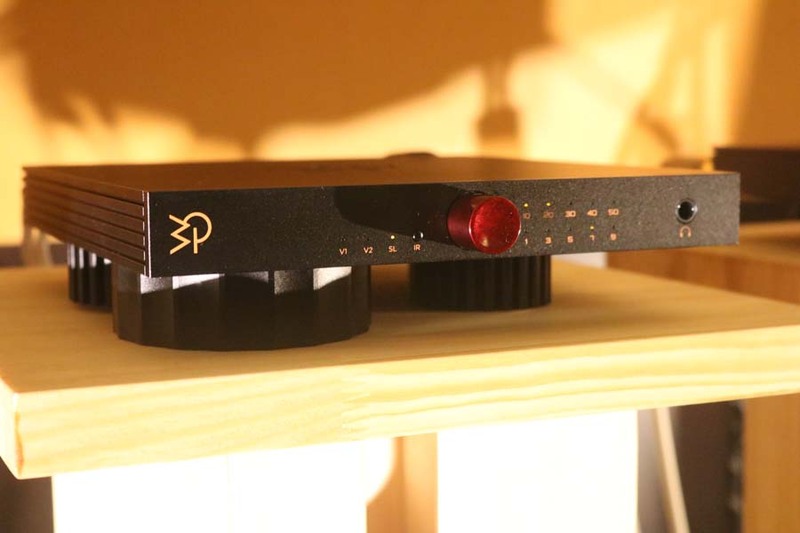 If you are in the market (and have deep enough pockets) for a great sounding and yet elegantly put together package you really should hear this. 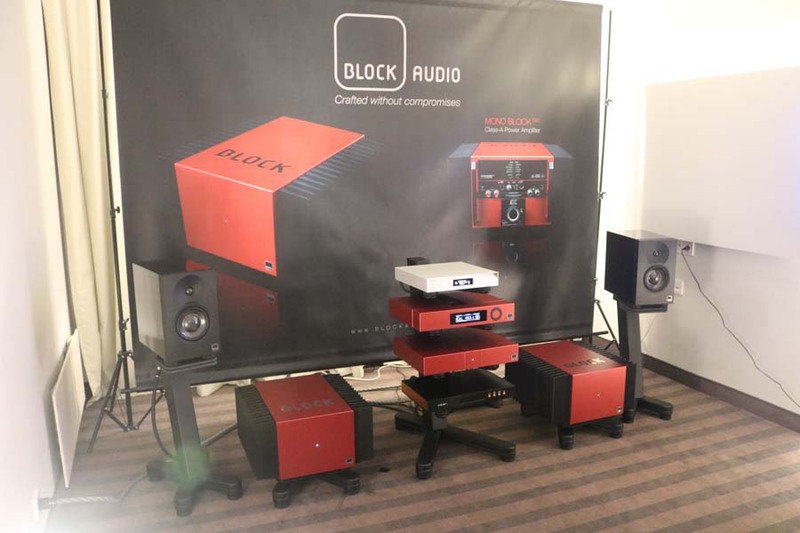 Made in the Czech Republic Block Audio are a relatively new name to me, though when we have heard them in the past we’ve both certainly enjoyed them. 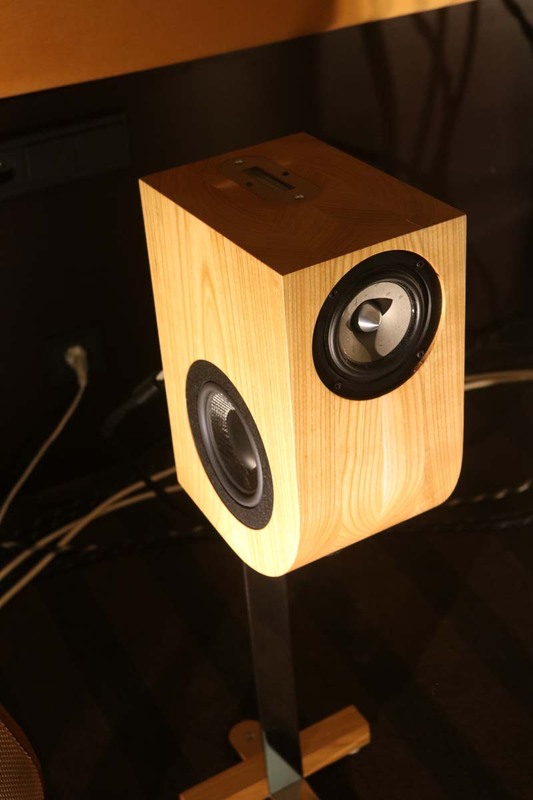 The speakers were a new design and are called Shelf Block. It’s a compact two way design featuring a rear firing port. 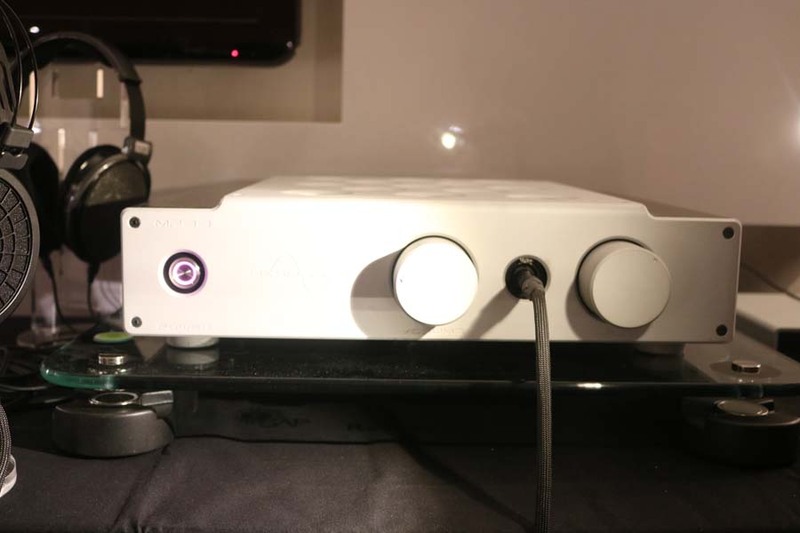 They have an Aluminium front baffle that is 40mm thick, sport custom drivers and the company say they only use the “Absolute quality capacitors and inductors”. Internal wiring is solid silver in Dupont Teflon. They measure 216 x 340 x 400mm (WHD) and weigh in at 29Kg each. The amps on the day were Mono Block (see what they did there?) 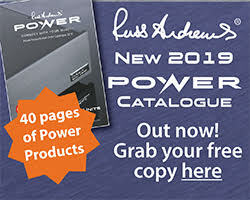 and give out an impressive 200 Watts of Class A power. All circuitry is discrete and there is DC signal coupling with servo control. They use a 2500 VA custom made toroidal transformer which is its own decoupled and suspended case. 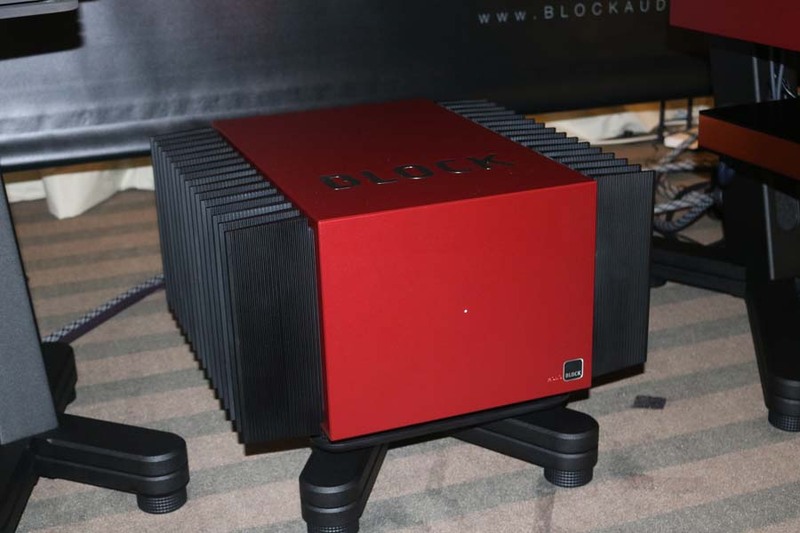 Finally the is the Line Block dual mono contril amplifier. 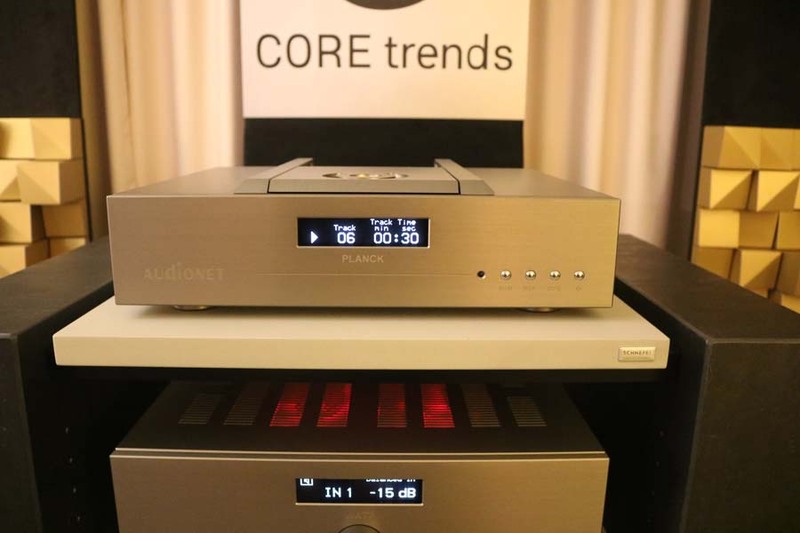 This is a dual chassis and dual mono design with each audio circuit having its own battery bank that allows at least 15 hours of operation – though you can switch between battery and AC operation. 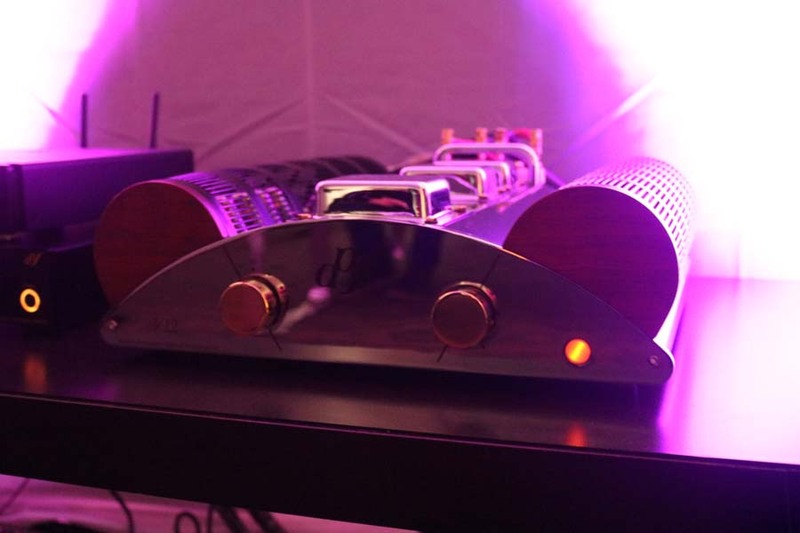 There’s a built in headphone amp and a built in MM/MC phonostage with remotely controlled settings. 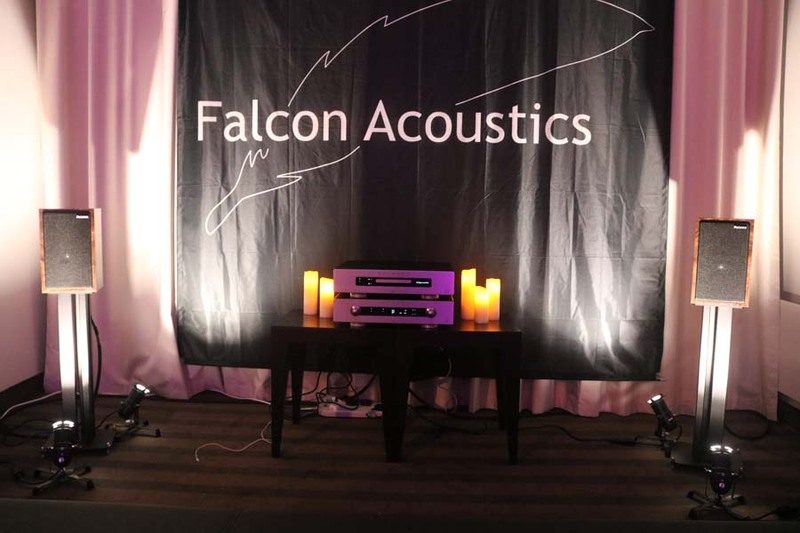 I absolutely love the aesthetics of these products and they sound great too. 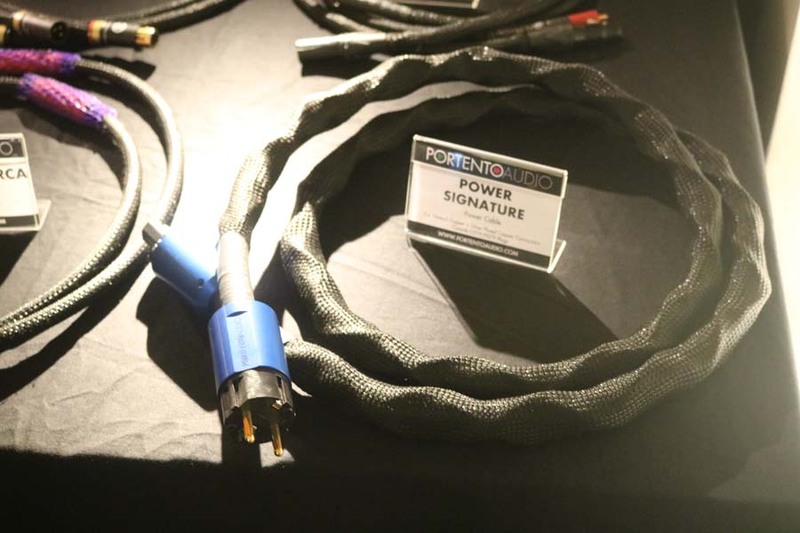 Italian brand Portento were showing off a wide range of cables including their brand new Power Signature mains cable which costs 2 500€ for a standard 1.9M length. 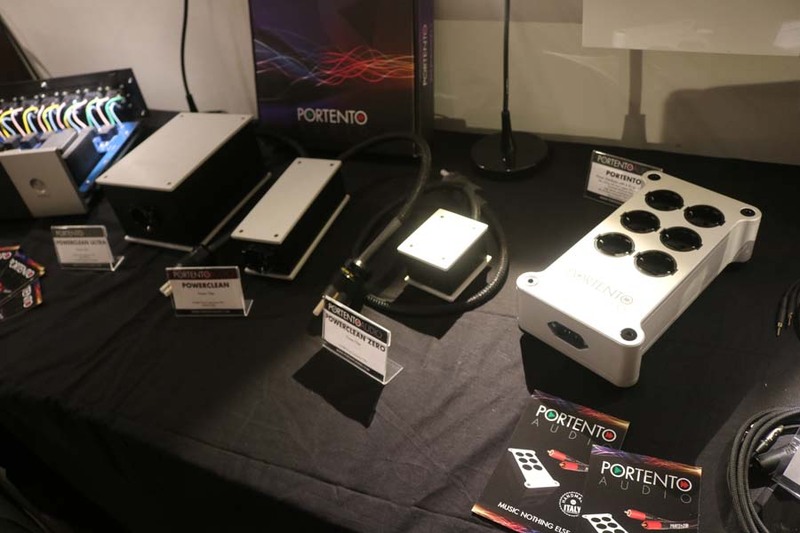 They were also demoing a prototype of a headphone amplifier using Mr Speakers headphones. 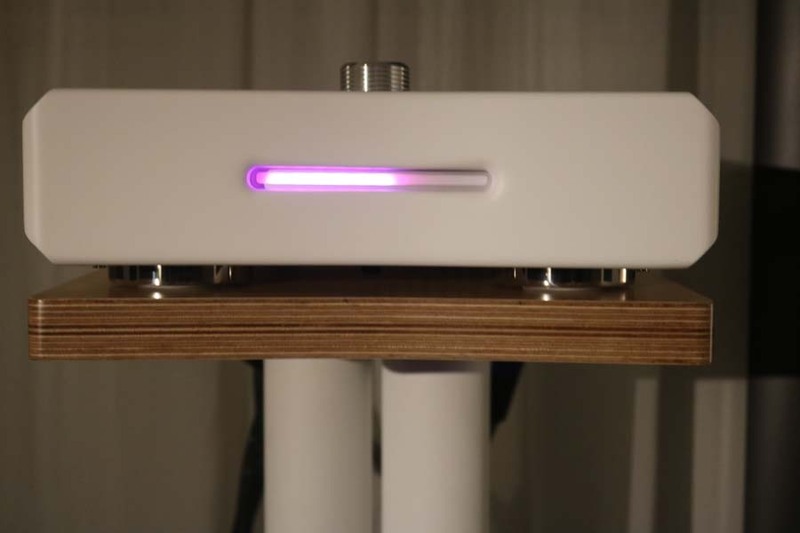 The amp will have zero feedback and will output 6W into 32 Ohms and 2W into 2 Ohms. 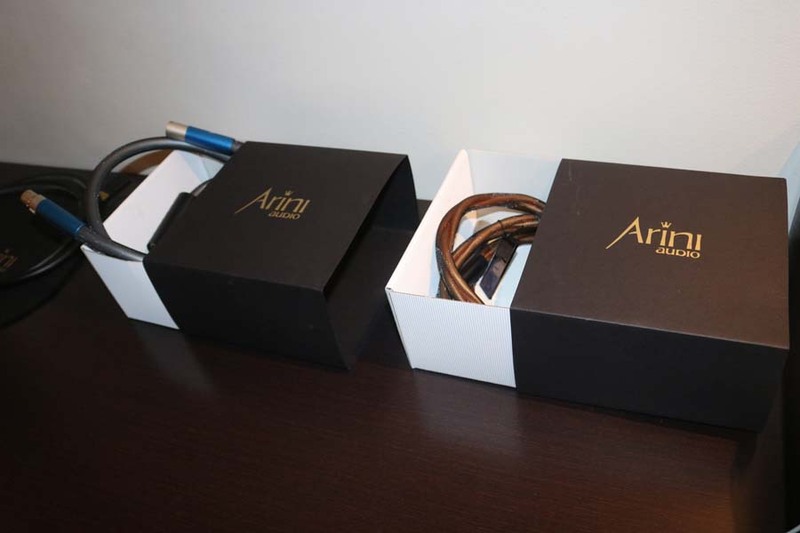 They will release the new headphone amp under the brand Harmonya. 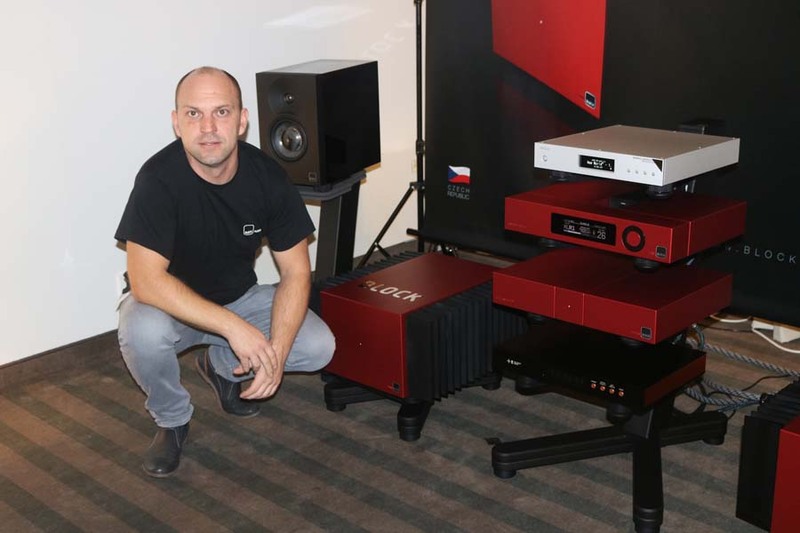 Rega needs no introduction and at Audio Video Show Warsaw they were using Saturn R and Elicit R CD and Amp combo through a pair of Guru QM10 speakers. 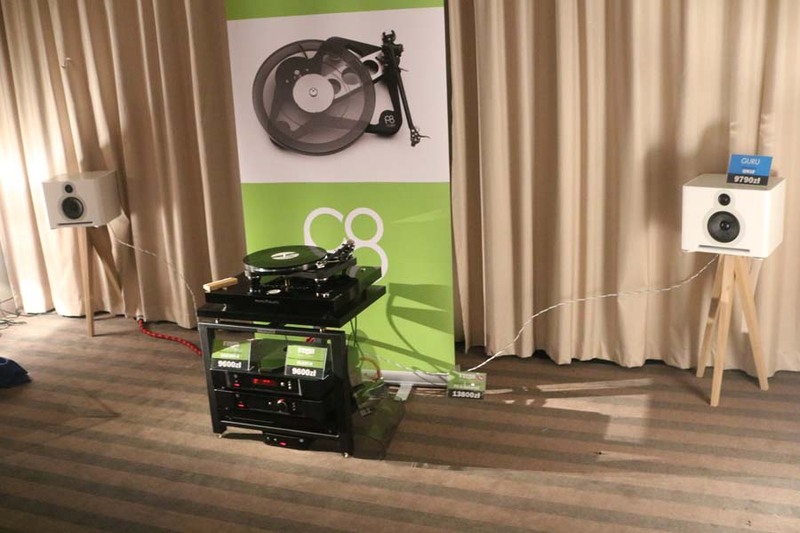 Famed for the turntables their was a Rega P8 in the room but we didn’t get a chance to hear it. 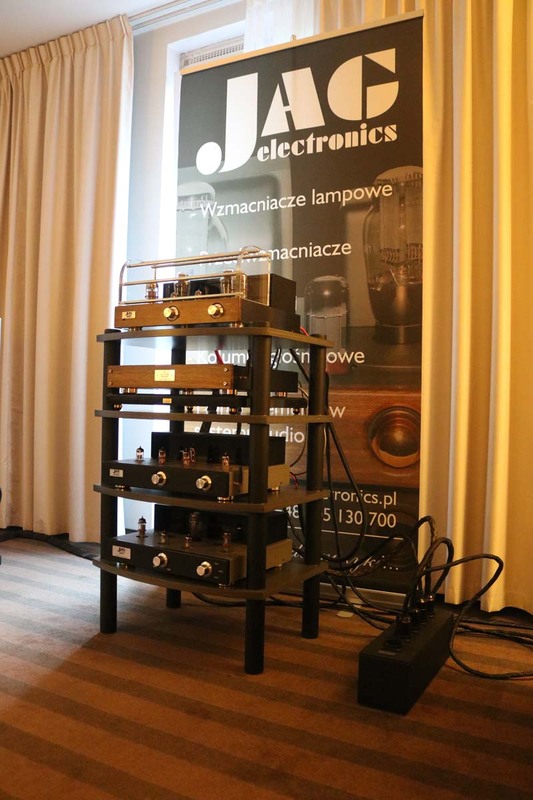 DIY audio is massively popular in Poland and for obvious reasons given the country’s past and relatively recent history. This room was absolutely packed with people as well as equipment. 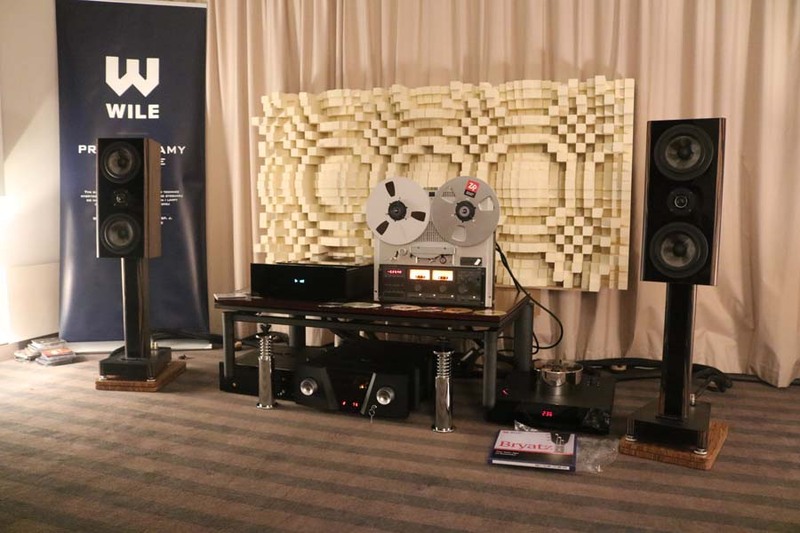 In all honesty the finish on some of the projects would put many pro-manufacturers to shame and the sound quality with whatever was playing in the room was equally impressive. 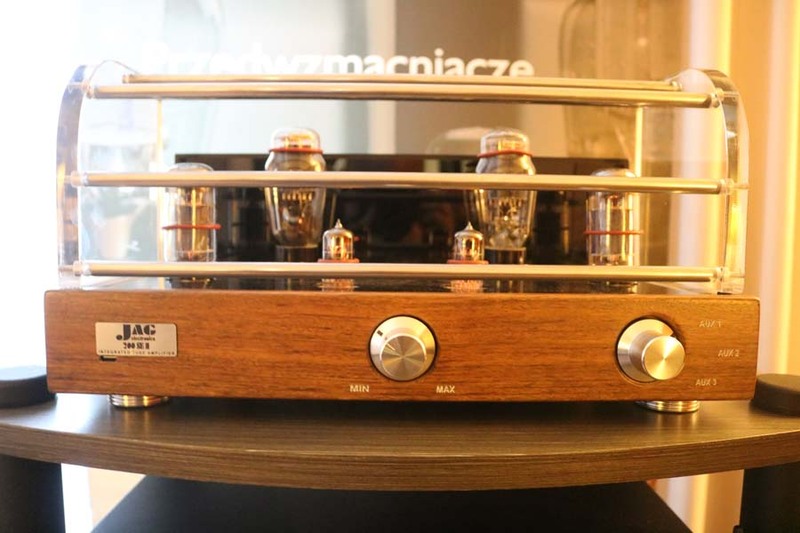 The Polish DIY Community website is a forum where users are free to talk about their builds and designs with the understanding that they share their designs with other users so they are able to build similar products. I thought this idea of a kind of Open Source Hifi was a great idea and we’ll be speaking to the group in the coming months. 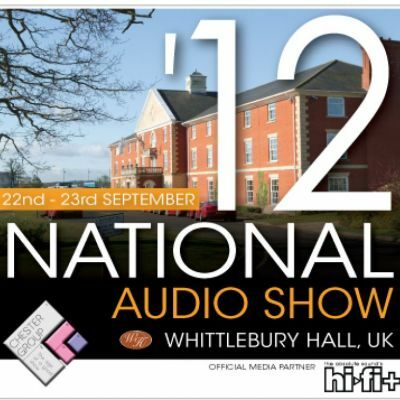 OK, this may not be the most exciting product at an audio and Hifi show but we got very excited when we saw it. The layout of our main listening space for the big system dictates that we have to have speaker cables in front of the door to the next room in the house. When visitors come to visit and need to spend a penny we’re forever saying “watch the cable and don’t stand on it”. We saw these cable protectors and immediately went “YES!” and when we got home we ordered one. These pictures were actually taken over a couple of rooms. 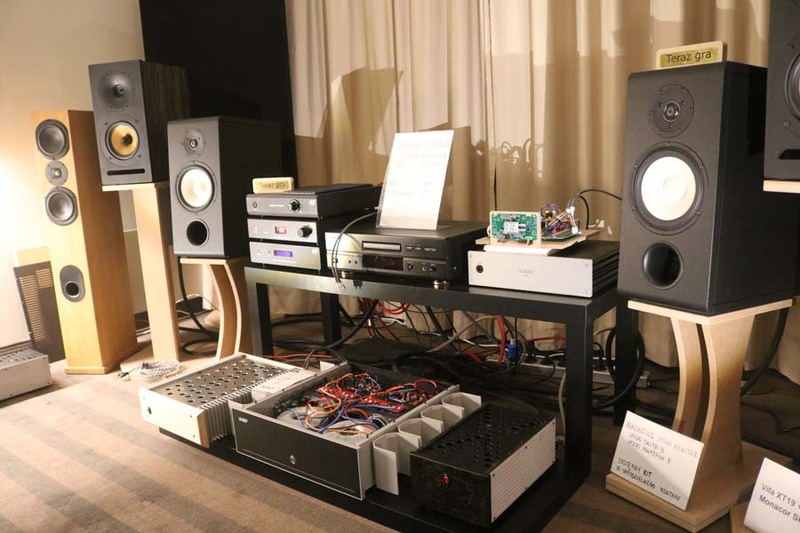 The first room had Graham Audio LS6F speakers, Consonance amps and a Lumin streamer but also Soul Note’s SD300 DAC and Amplifier combo. 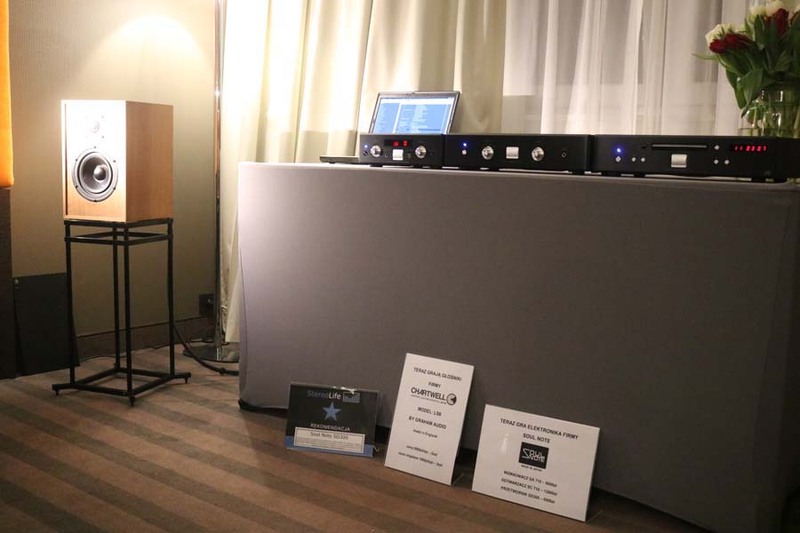 Room two had Graham Audio Chartwell LS6 and were using Soul Note electronics. 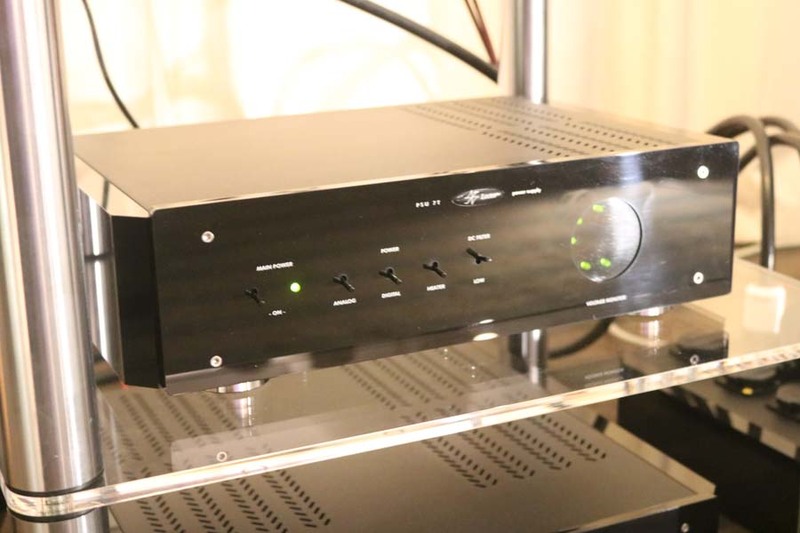 Soul Note look very simple and unassuming but they always seem to pull out the goods when ever we’ve heard them – indeed we bought their amp after we reviewed it a few years ago. The Graham speakers are relaxed and unassuming as you would expect. Sadly I didn’t get much information about this Warsaw based company. 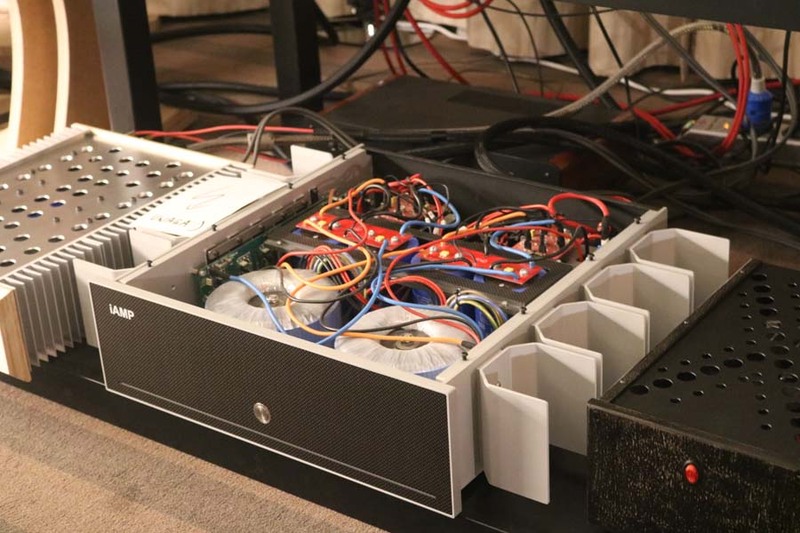 The amp on the floor is a hybrid integrated using ECC83 tubes in the preamp section and MOSFETS in amplifier section to deliver 200 Watts a side into 8Ohms. The Sarah CD player is next to the reel to reel player and the Mocarz mains transformer is to the right of the rack. Sound was great but I got a little lost in the music (ACDC) which has to be a good thing and great endorsement. This room was packed and so hot that Lin had to leave. Playing when I went into the room was the first amp you see which is the Delta OSE-1005 (catchy) which is a stereo integrated delivering 100 Watts a side. And then there was the elephant in the room sat in front of me – a monobloc amp the size and shape of a small wood-burning stove. 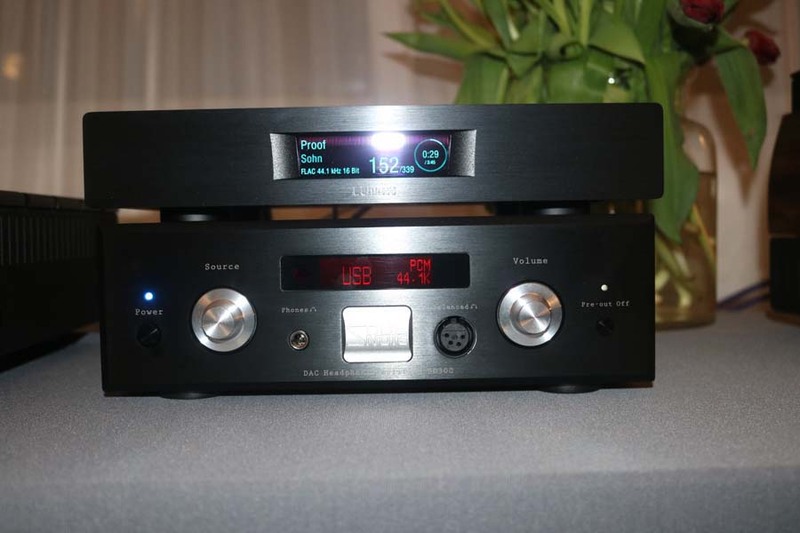 It’s the equally creatively named Delta OSE 150M delivering, you guessed it, 150 Watts of power. The chap running the room turned it on just as I got up to leave and not only did it look like a wood-burner, I’m sure it could have been used as one too.